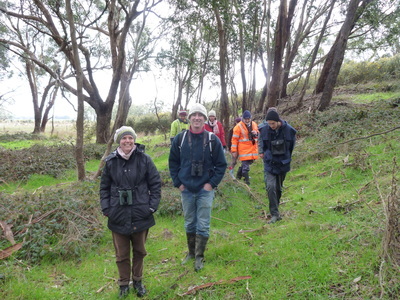 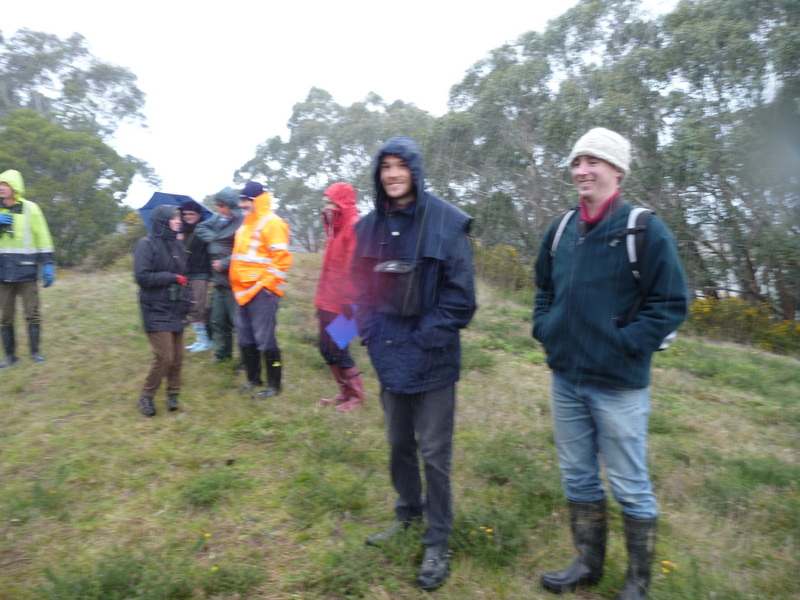 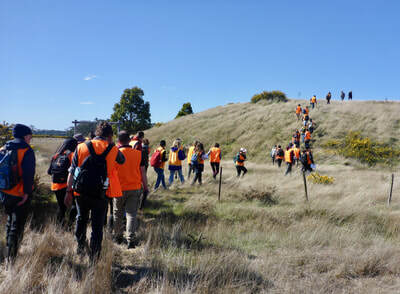 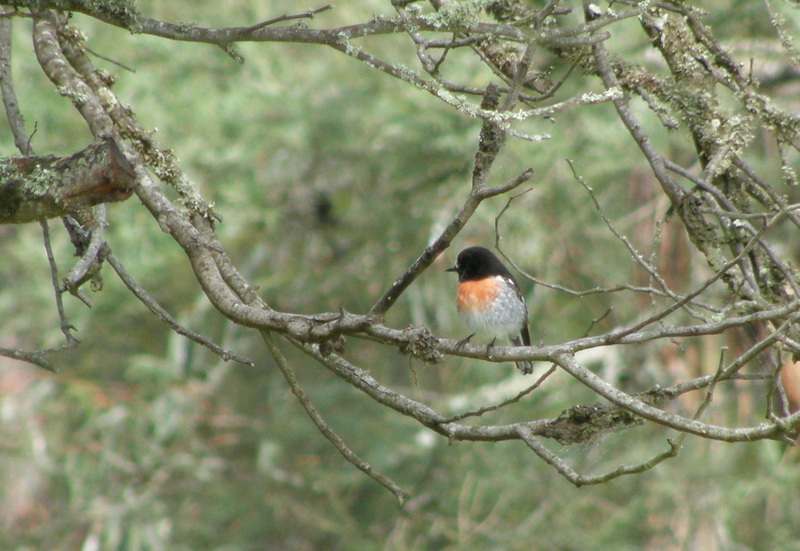 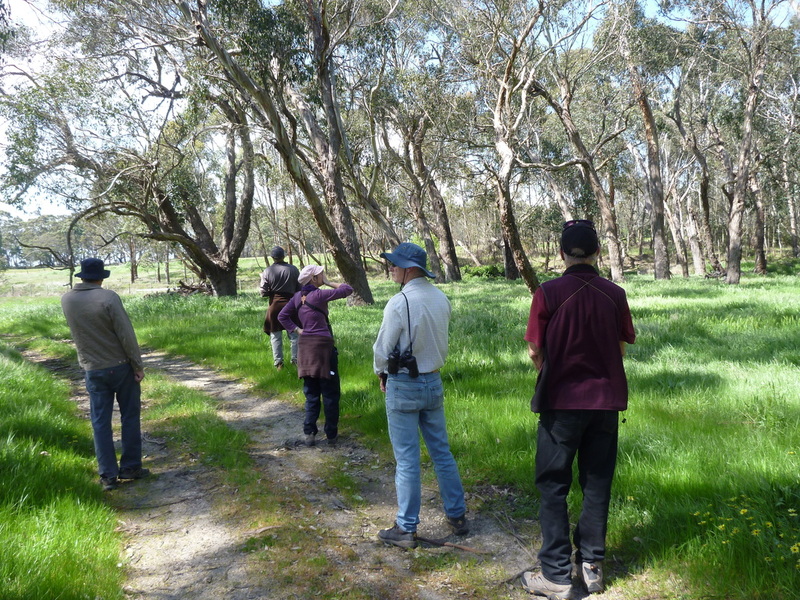 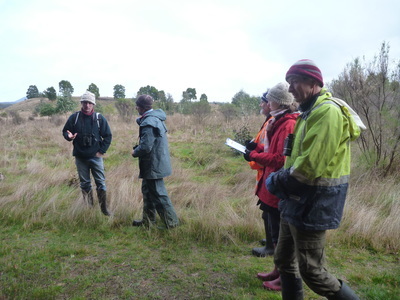 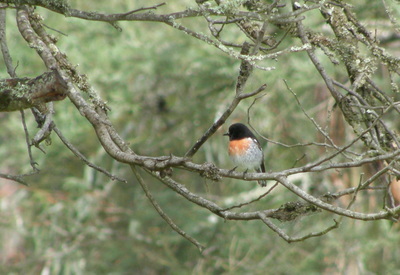 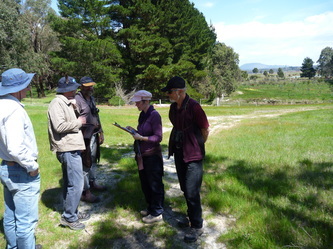 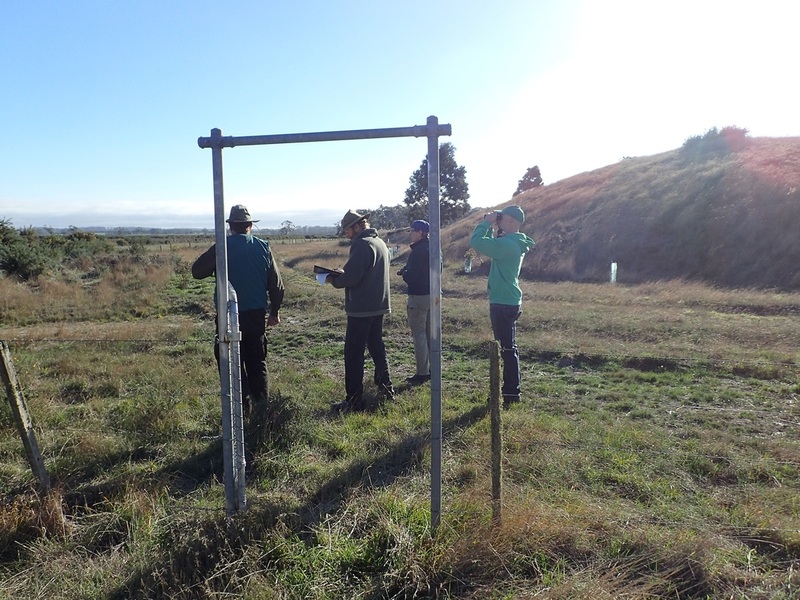 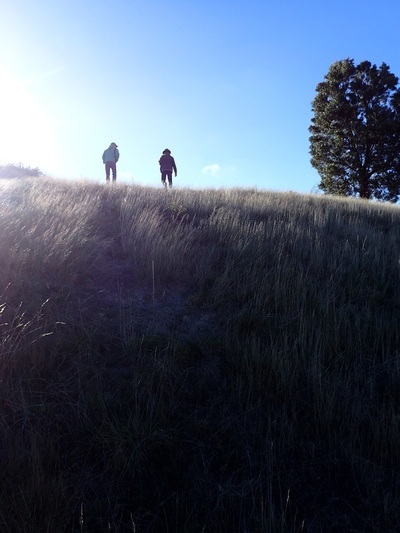 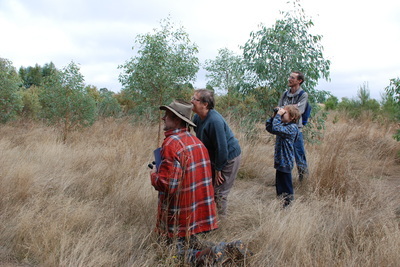 Spring bird survey on Sunday morning 20 October. Flush of new growth after heavy recent rains. 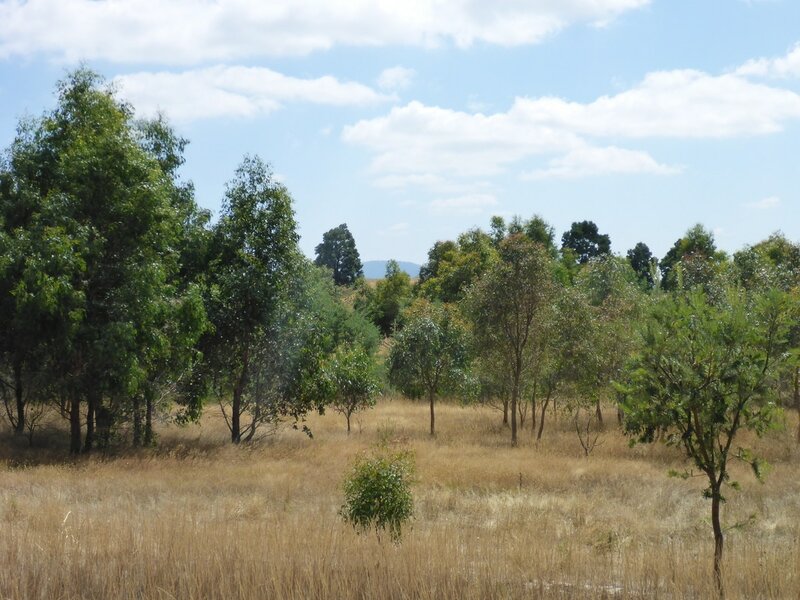 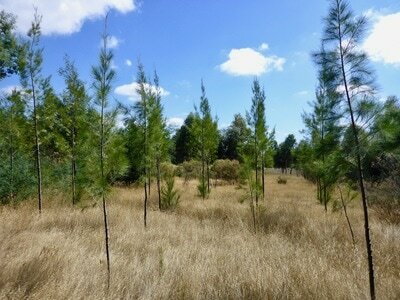 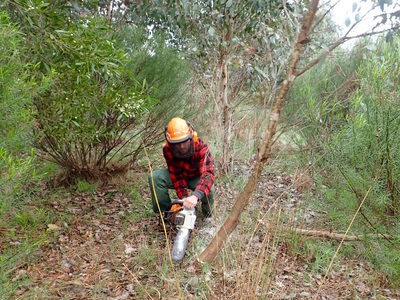 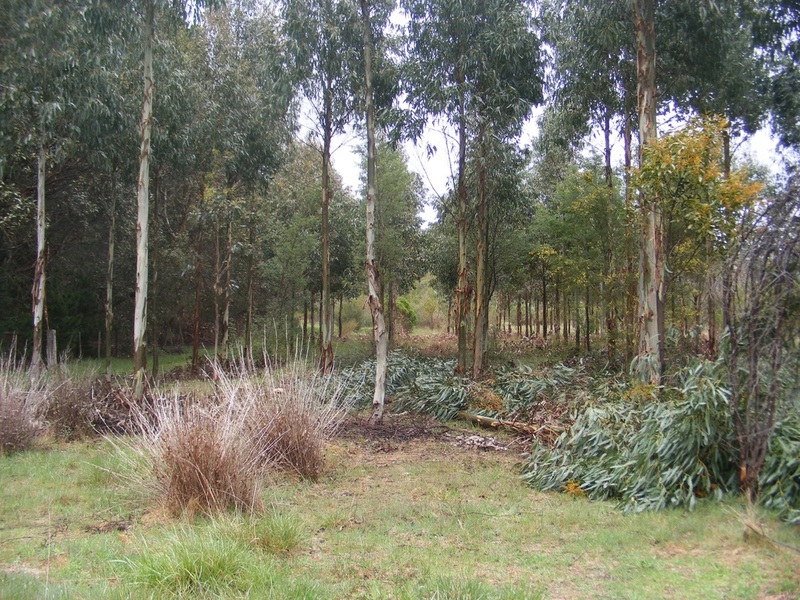 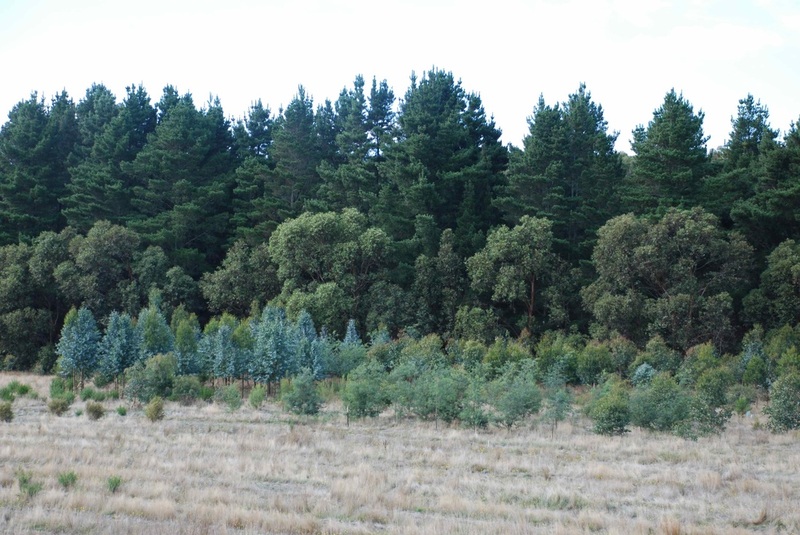 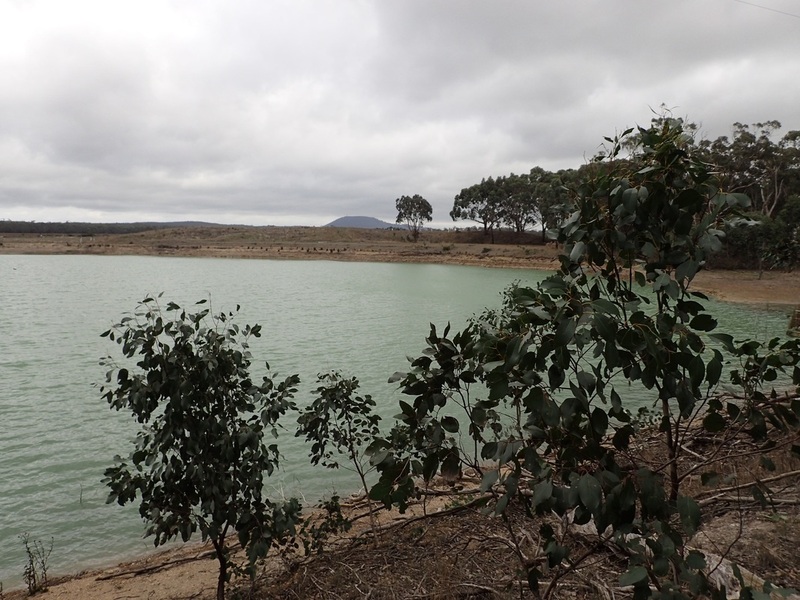 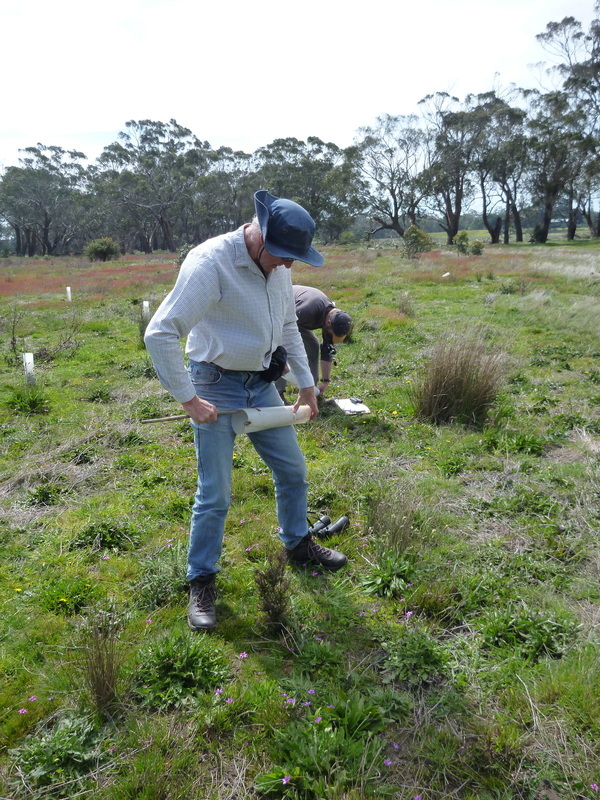 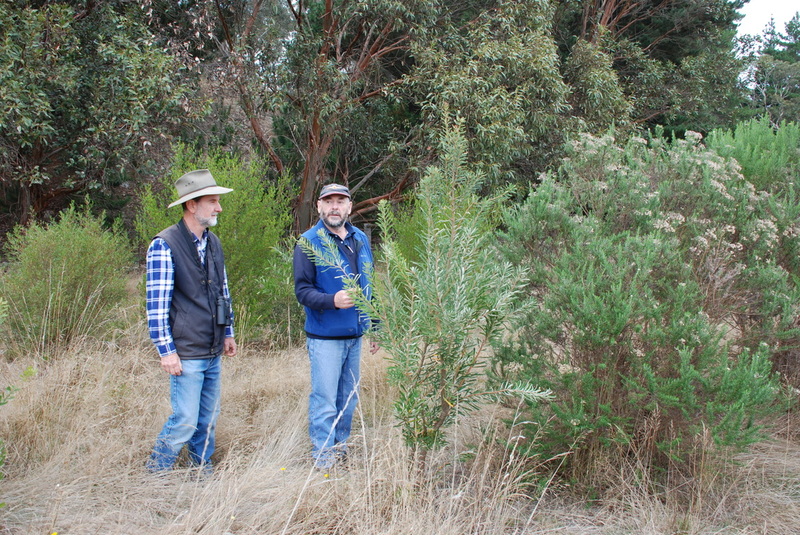 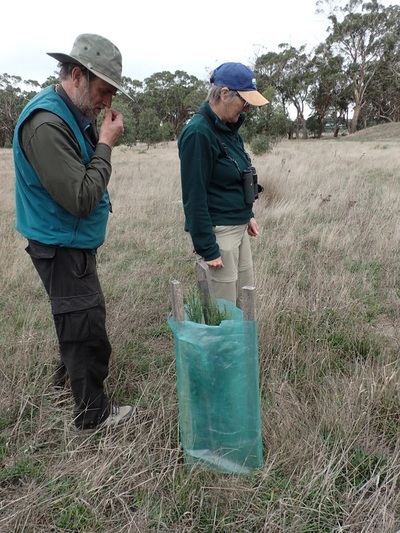 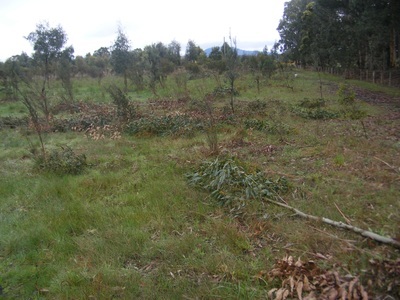 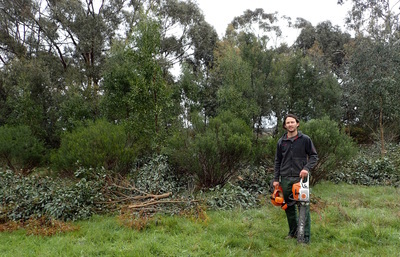 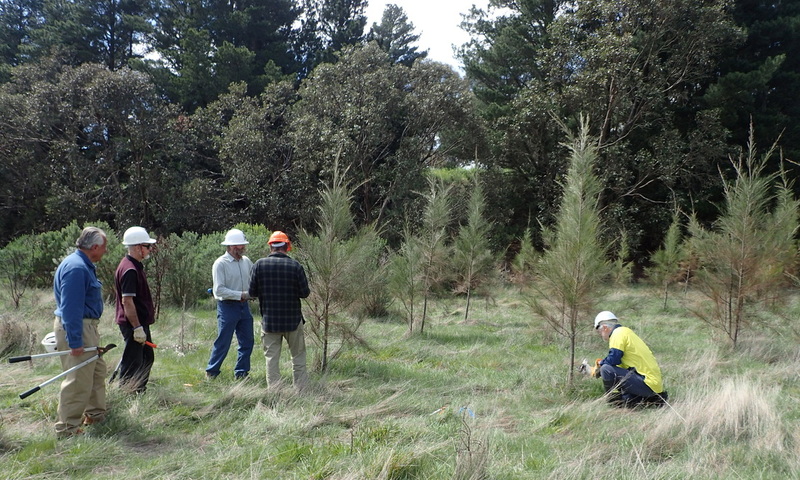 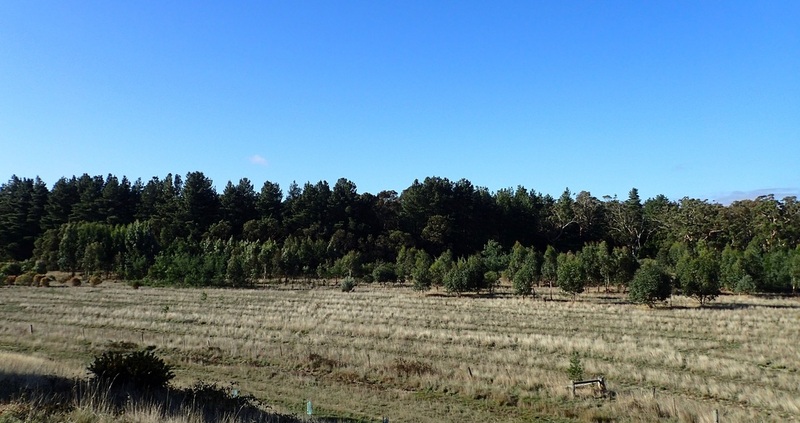 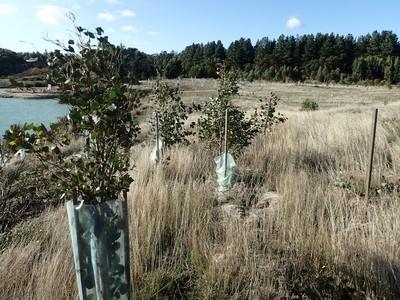 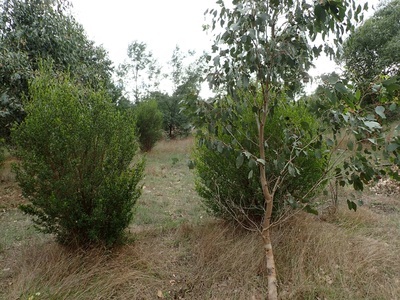 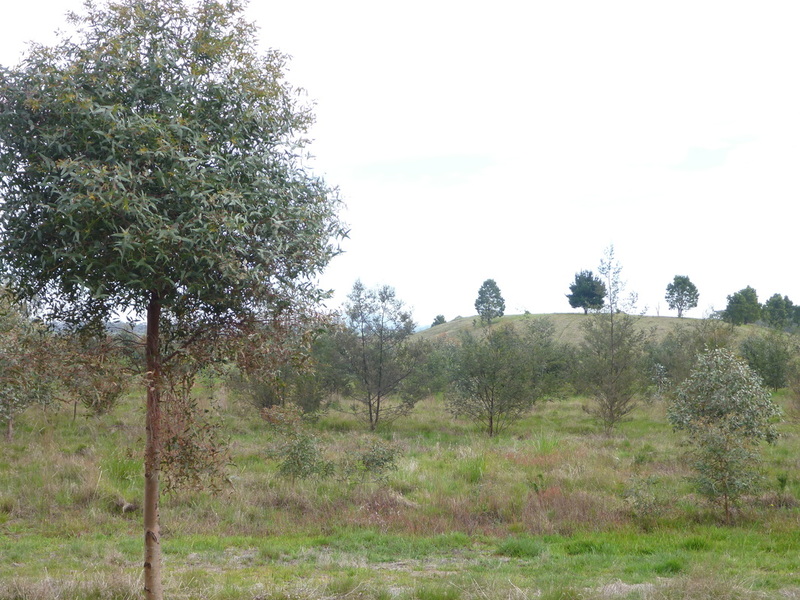 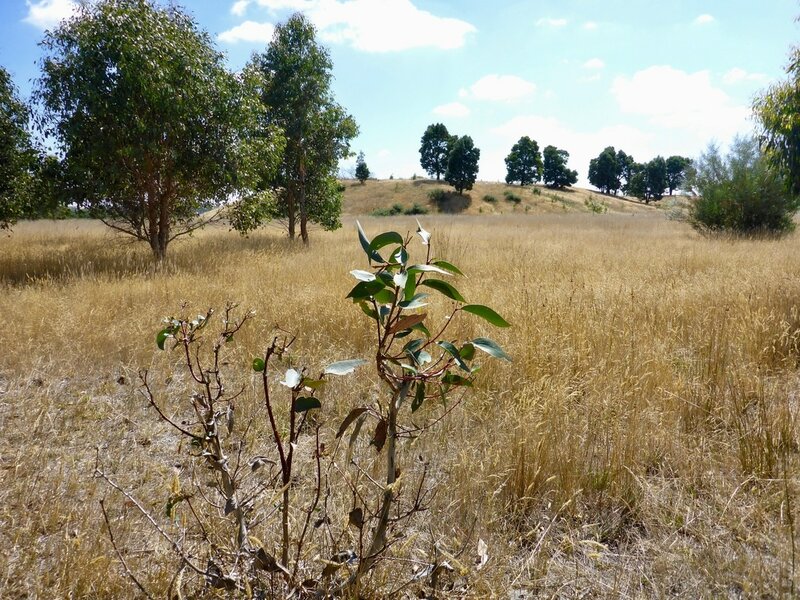 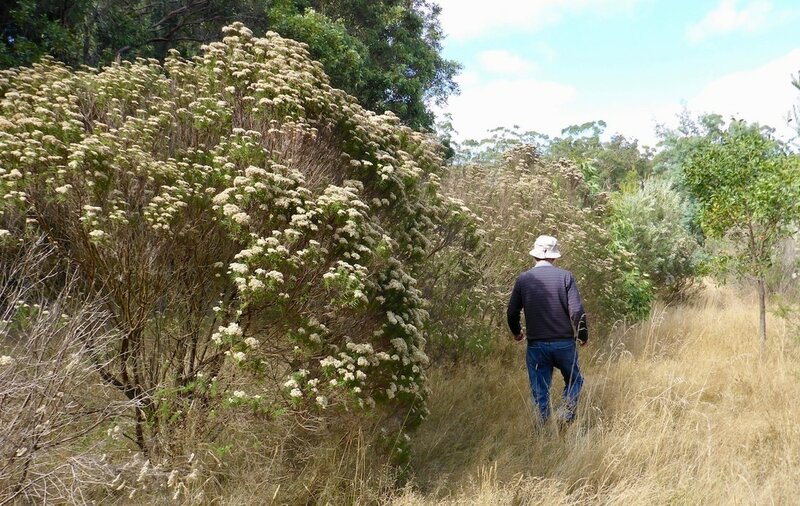 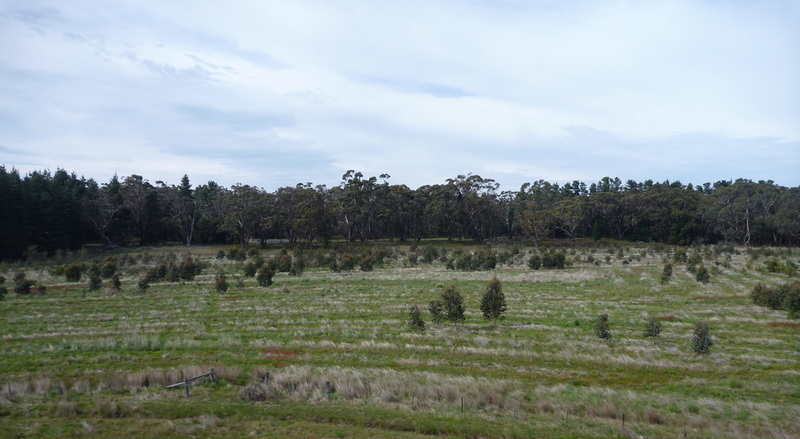 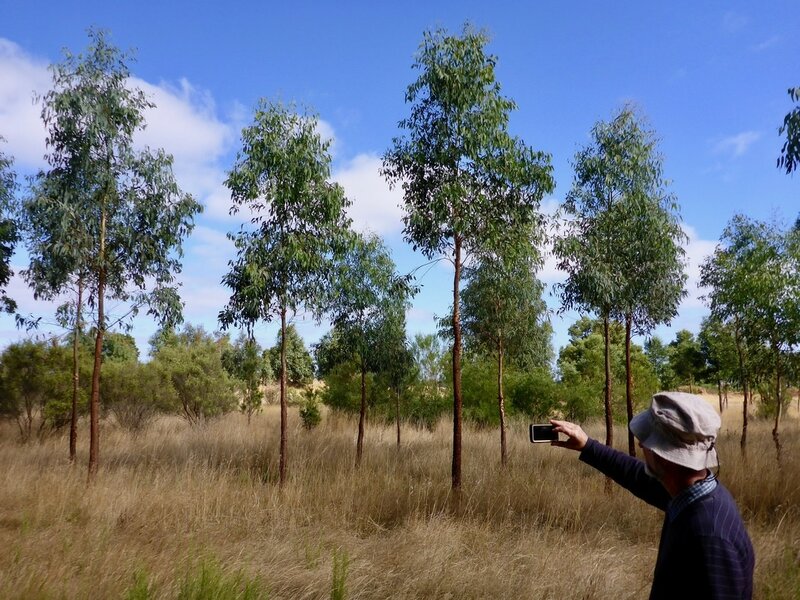 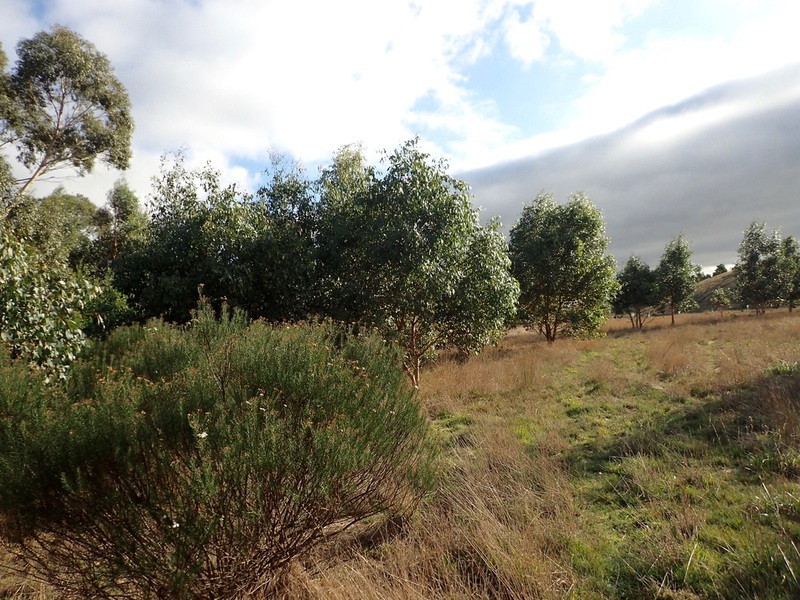 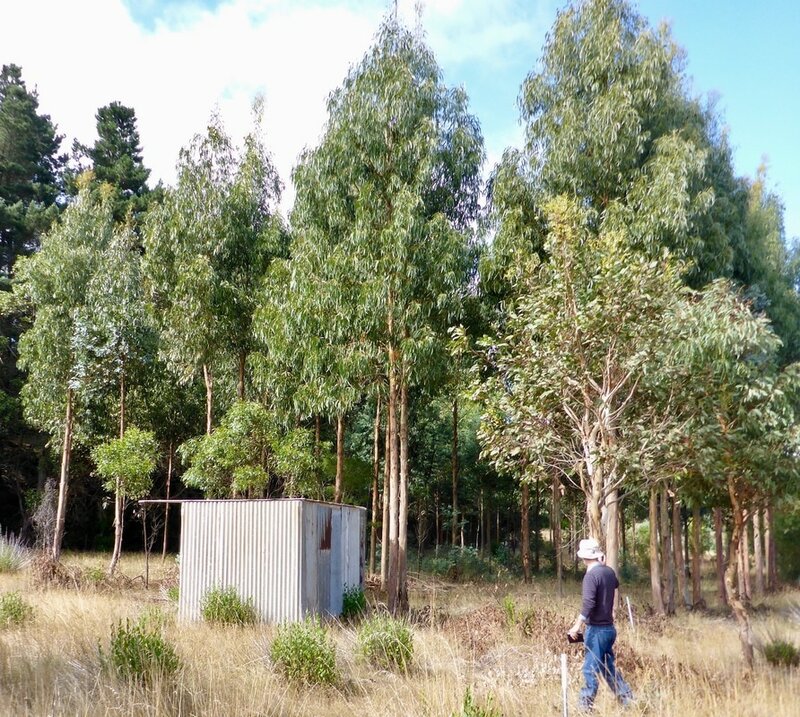 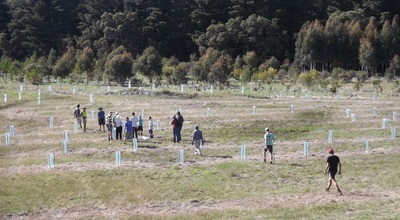 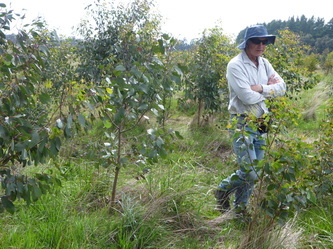 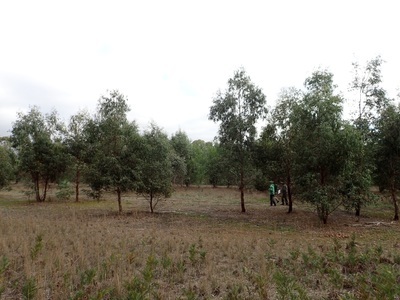 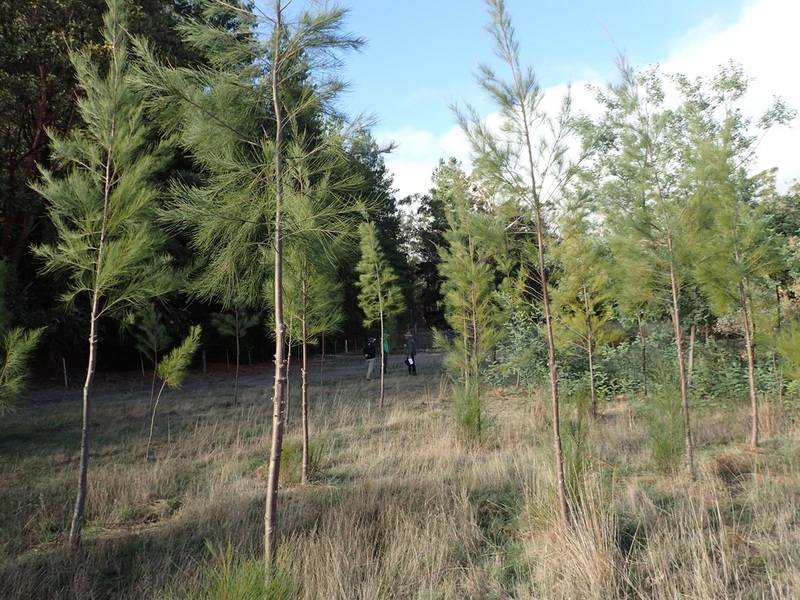 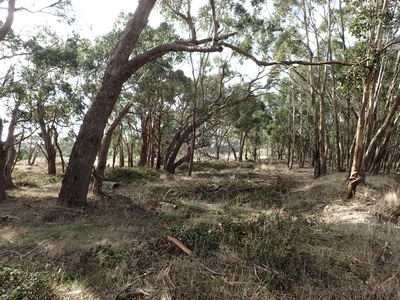 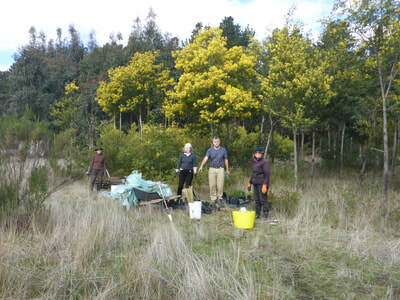 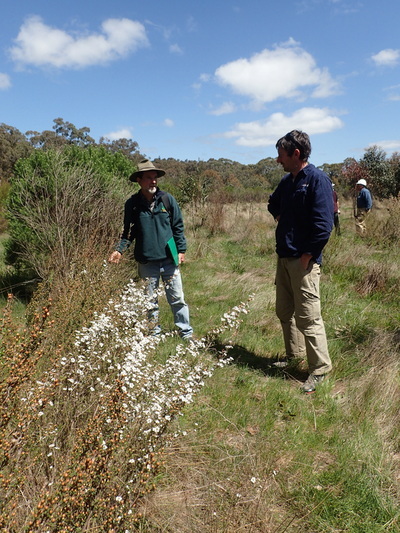 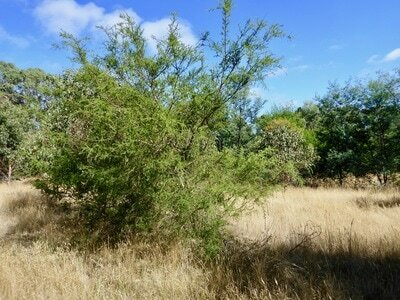 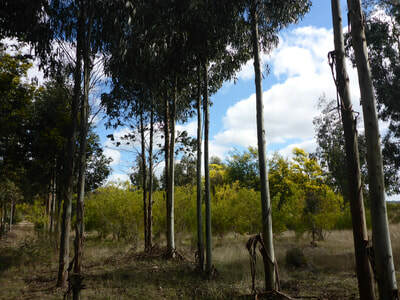 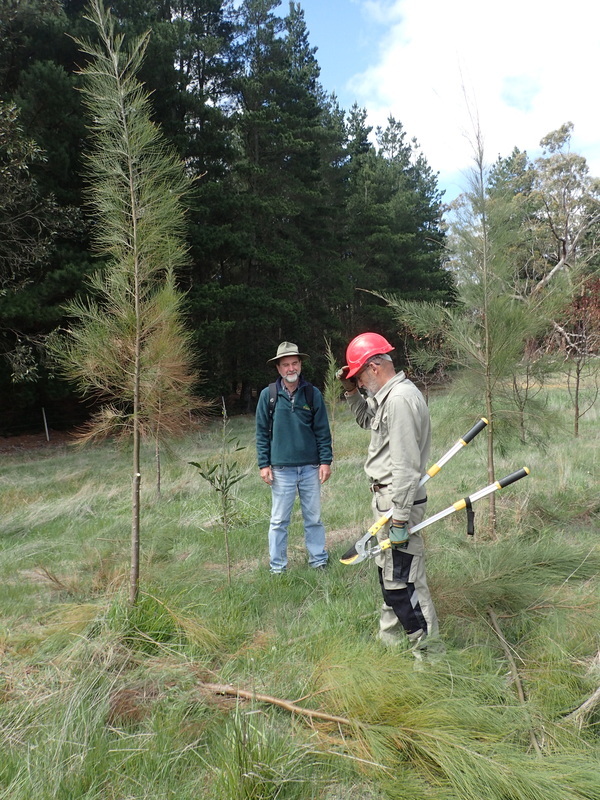 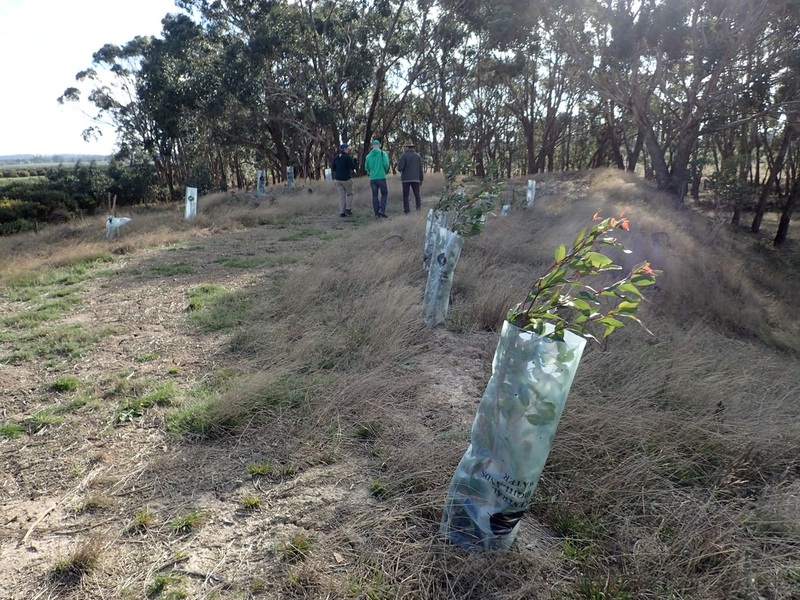 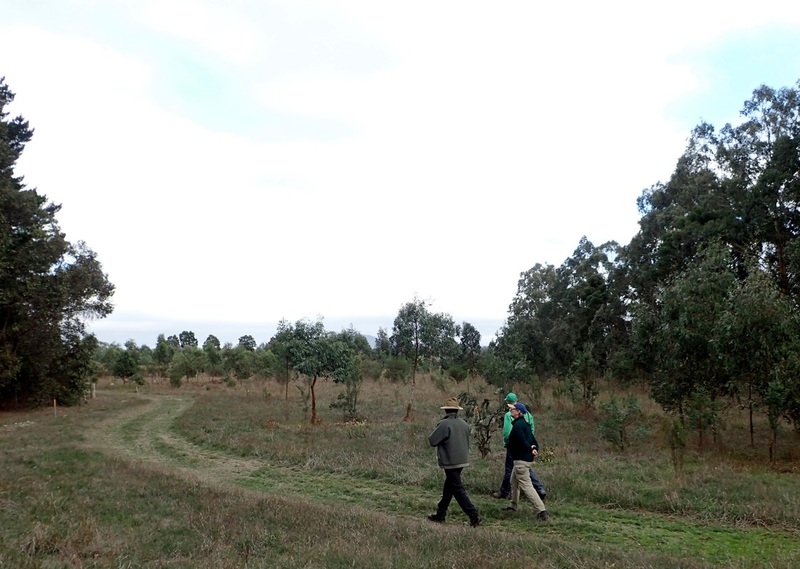 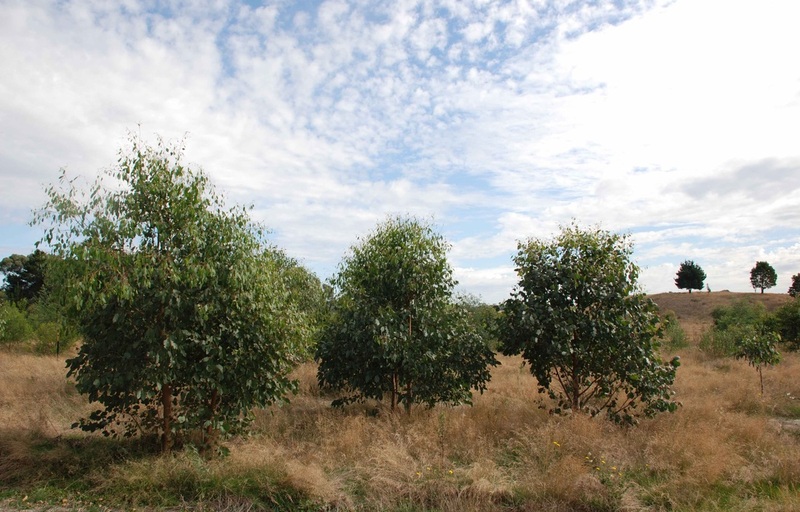 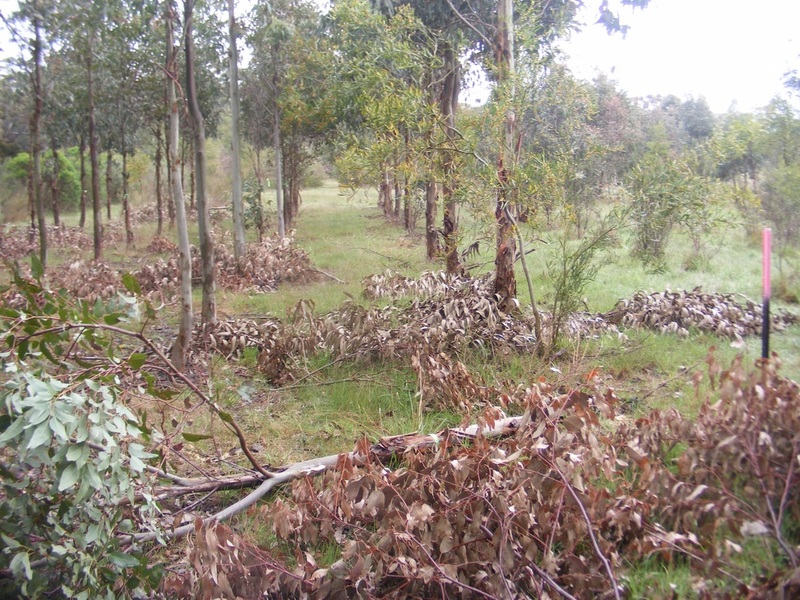 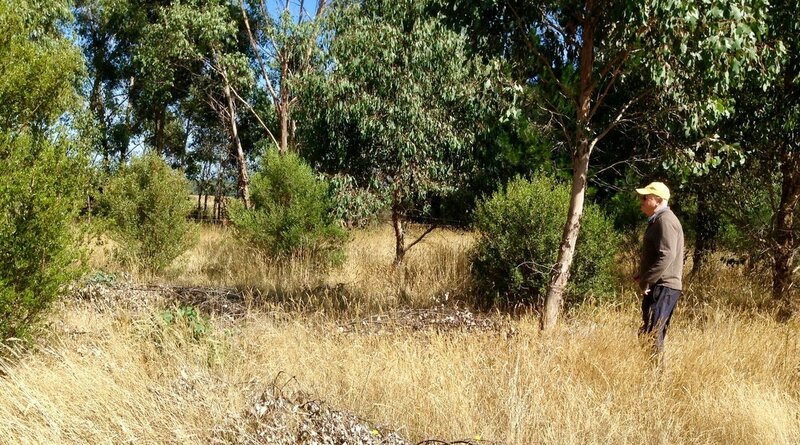 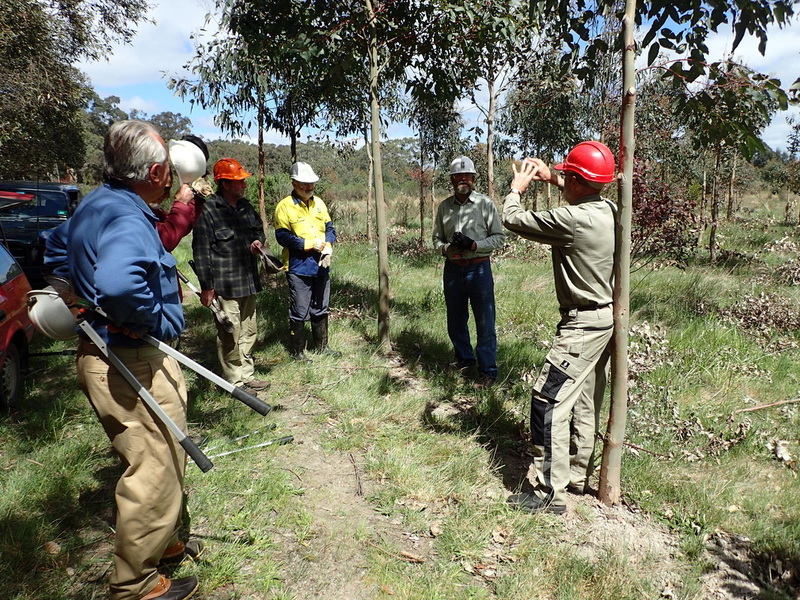 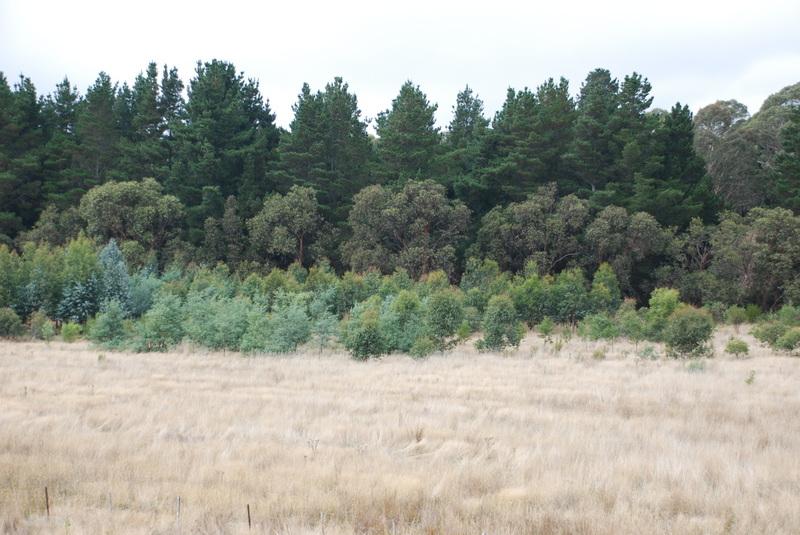 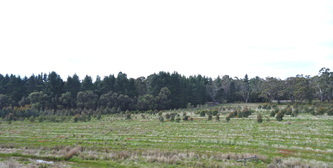 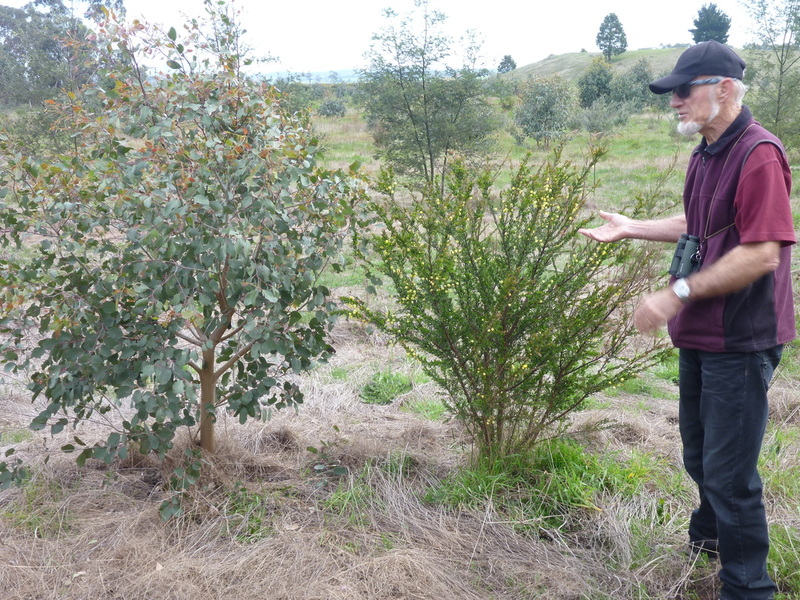 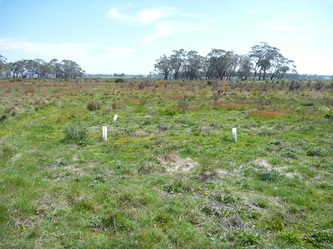 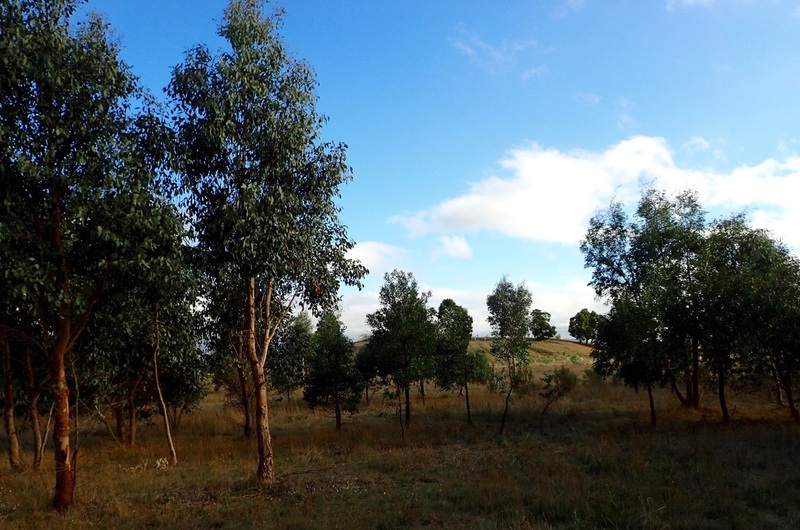 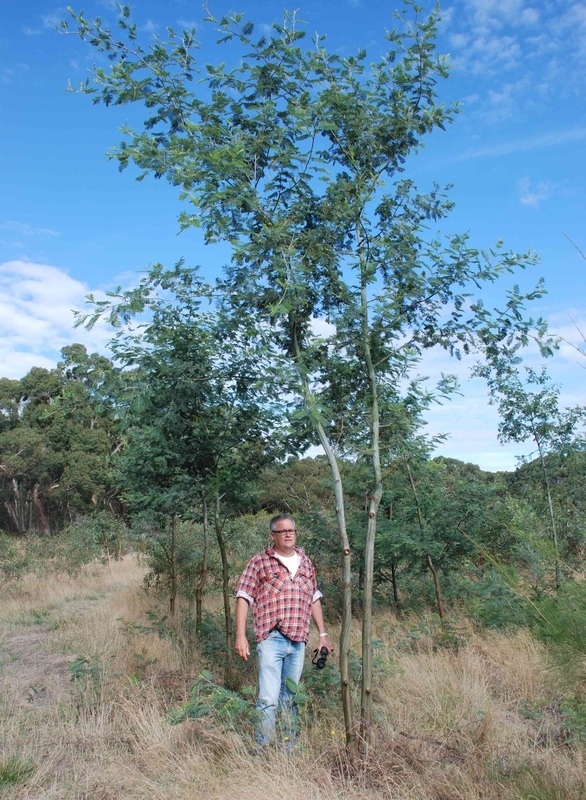 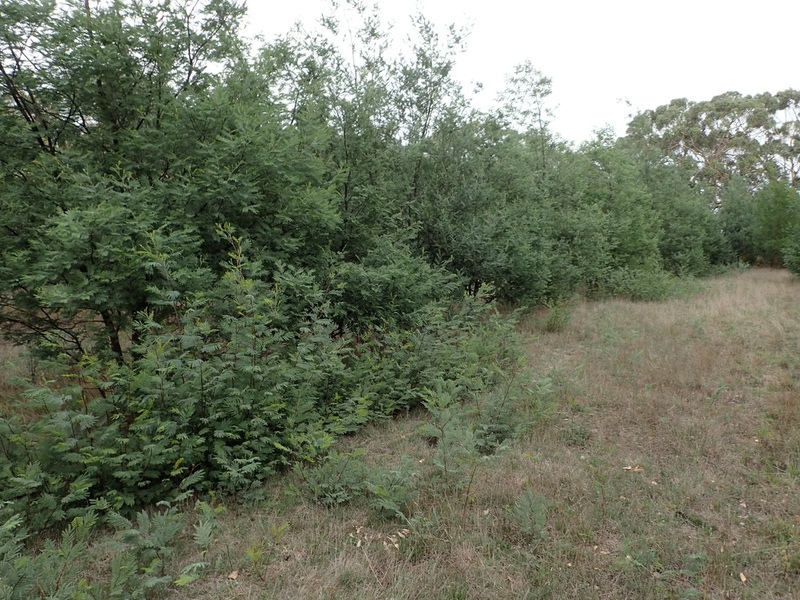 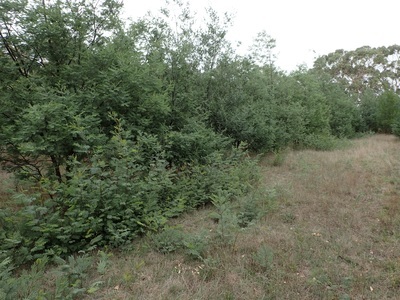 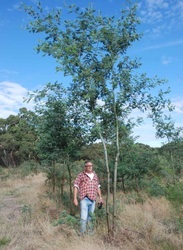 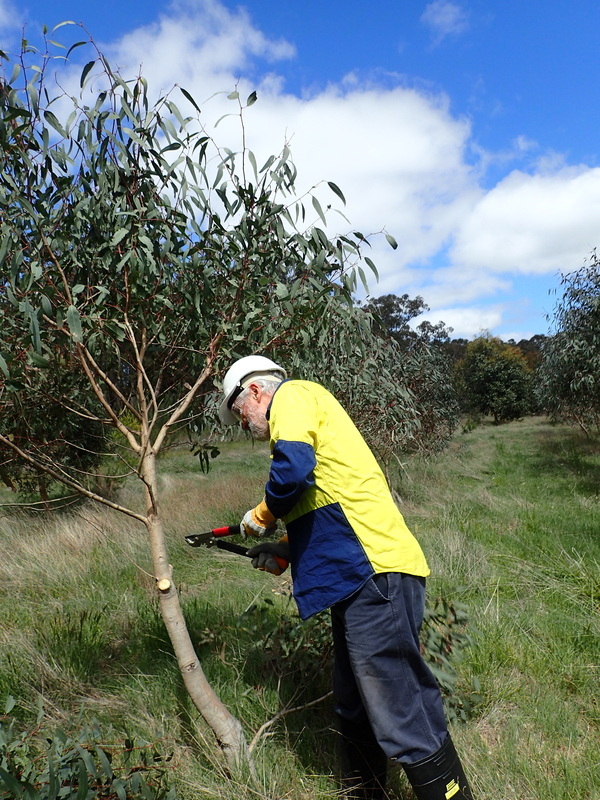 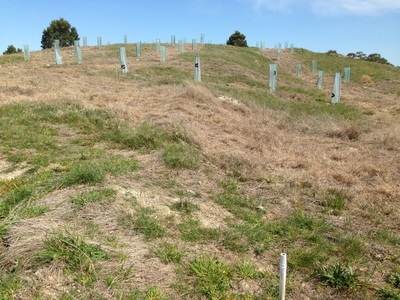 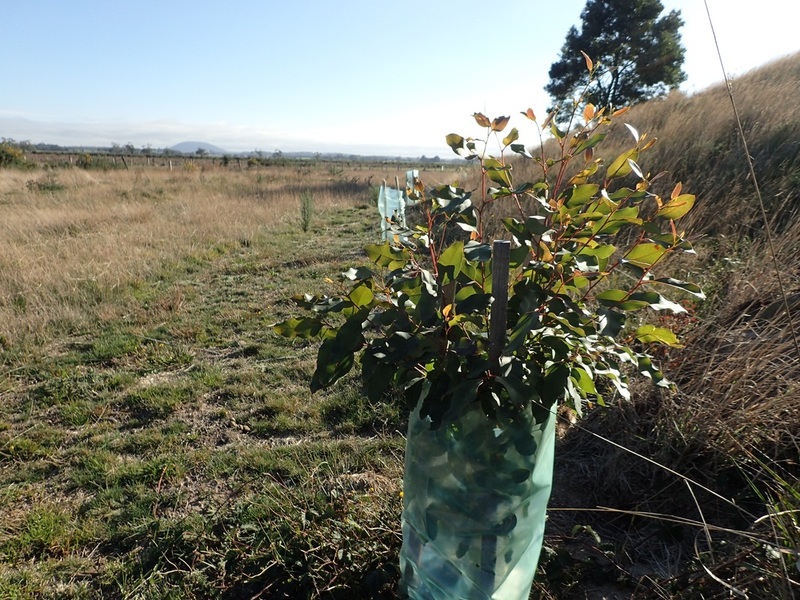 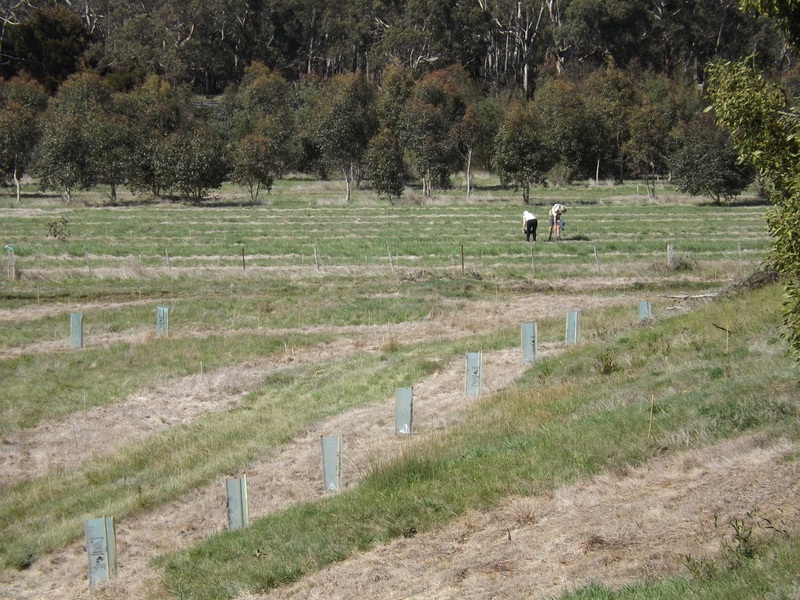 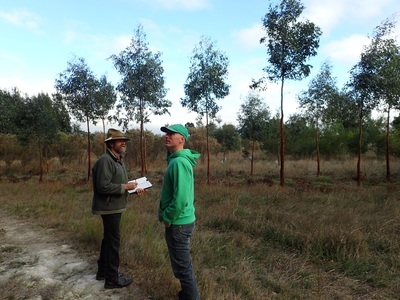 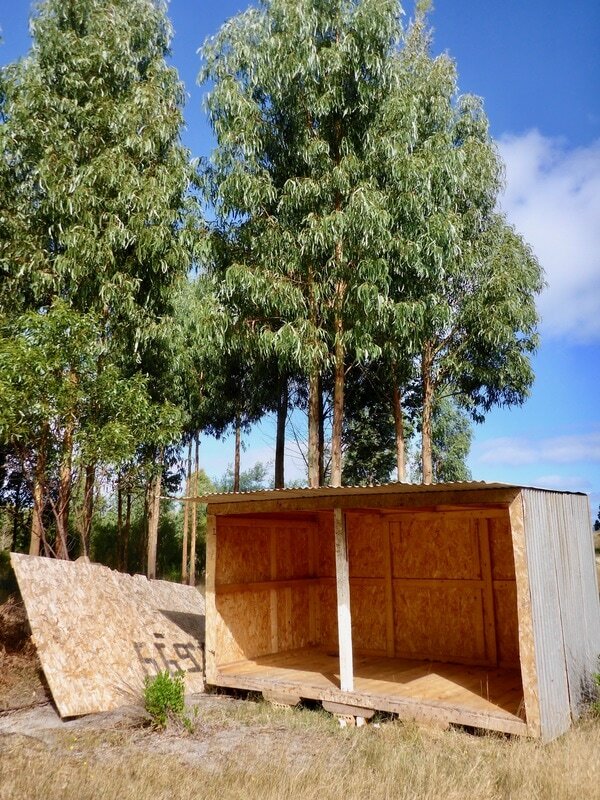 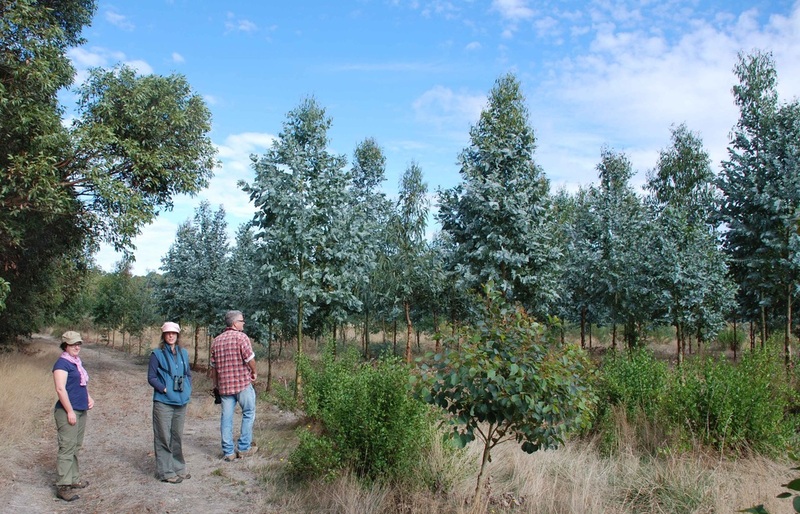 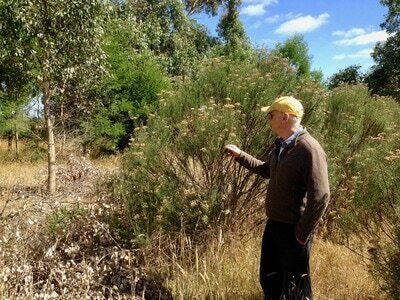 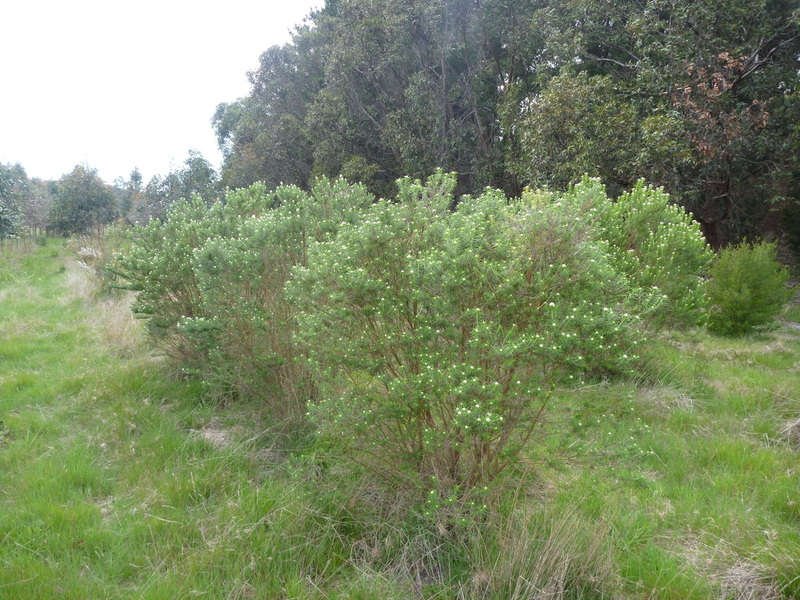 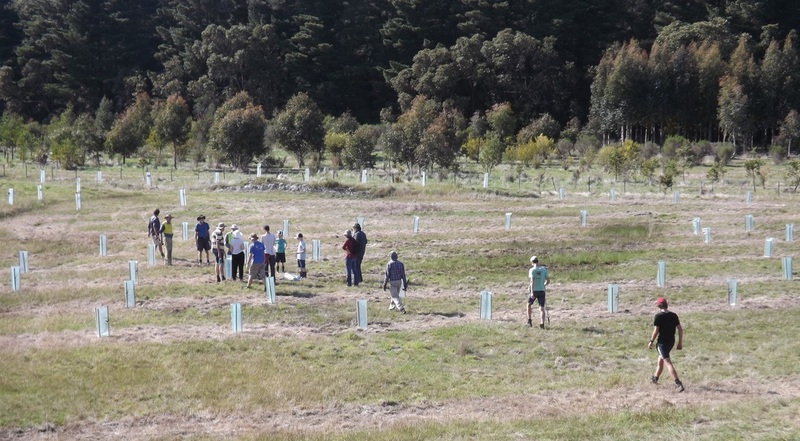 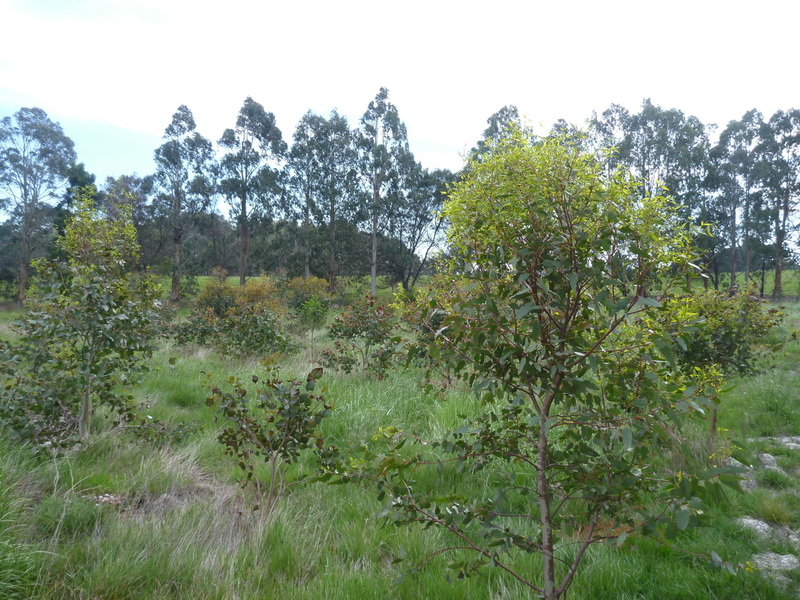 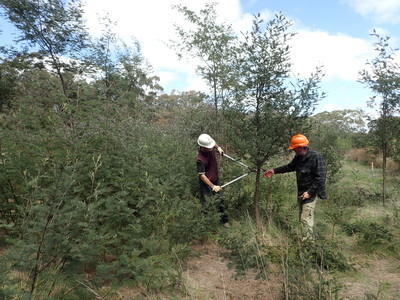 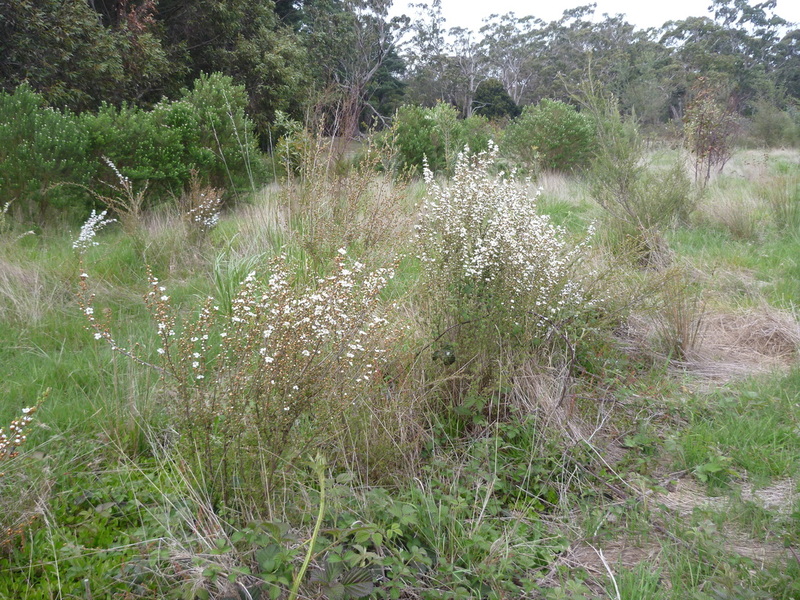 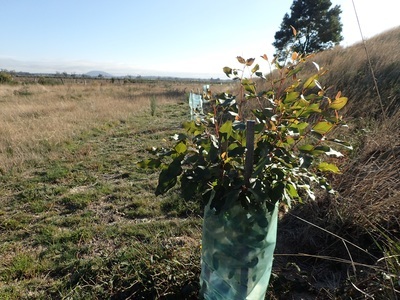 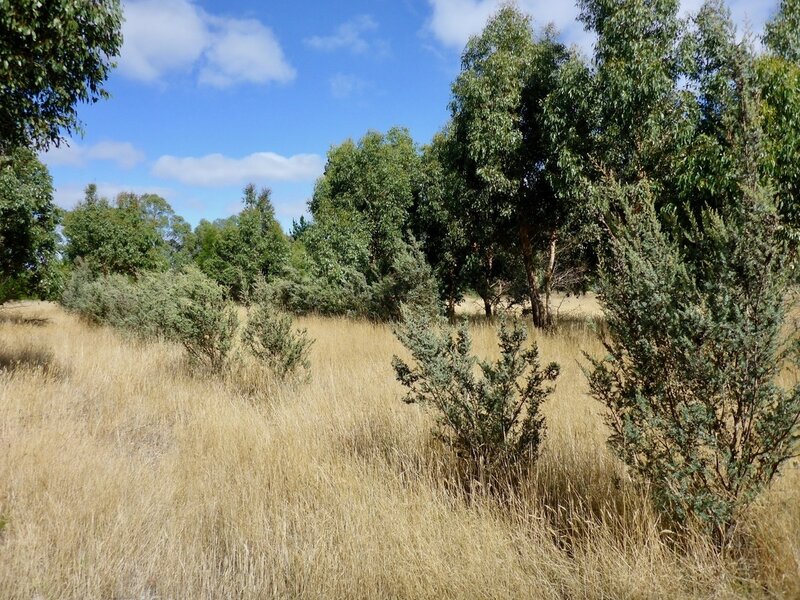 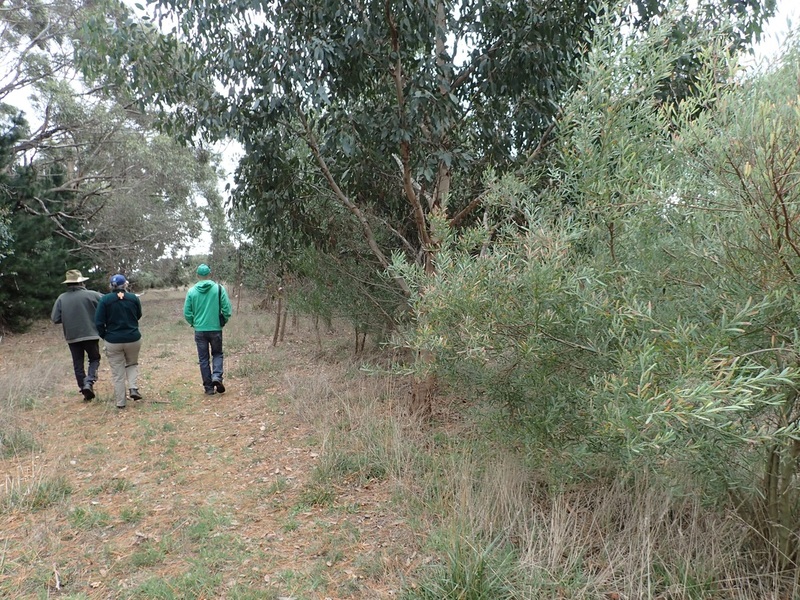 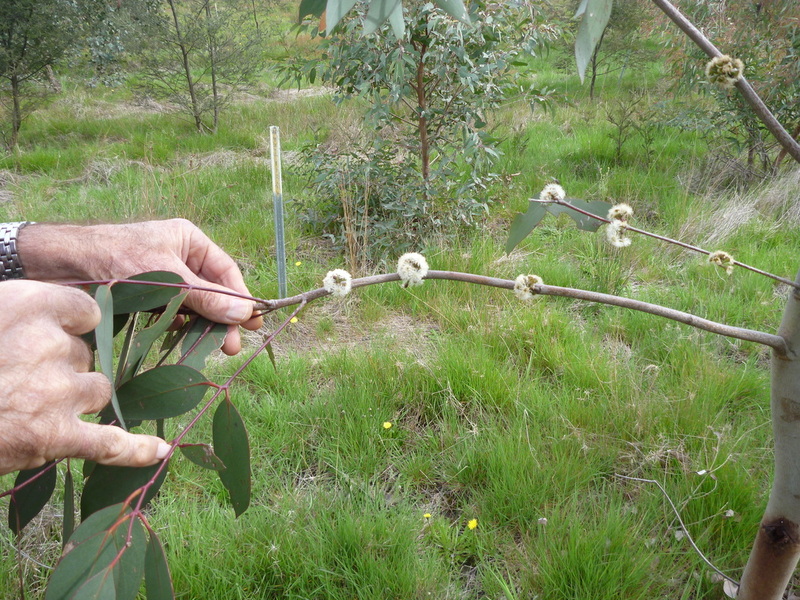 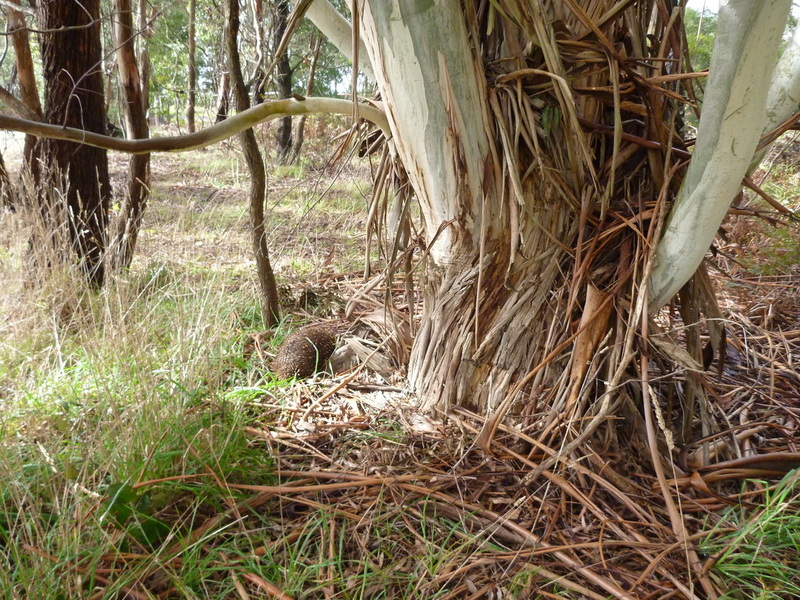 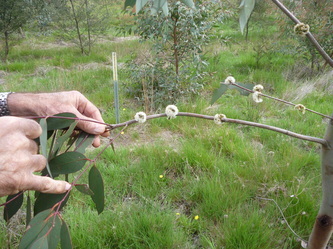 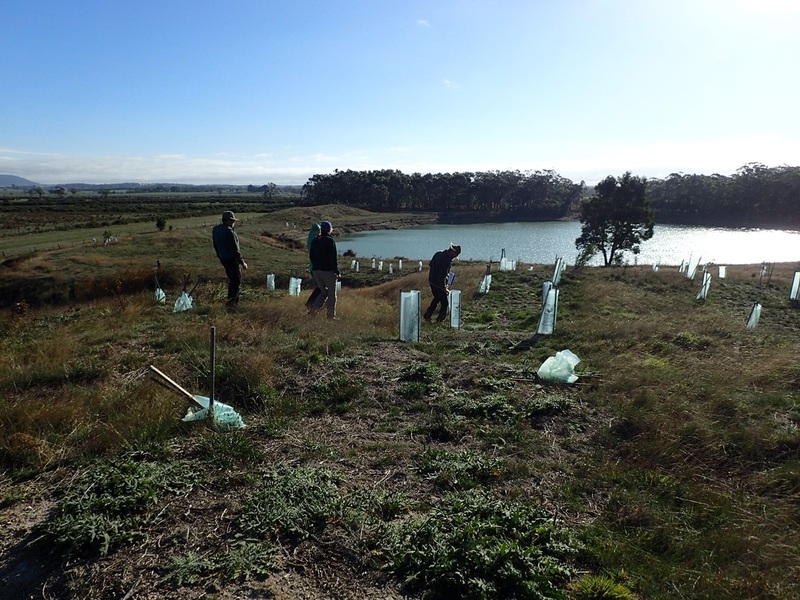 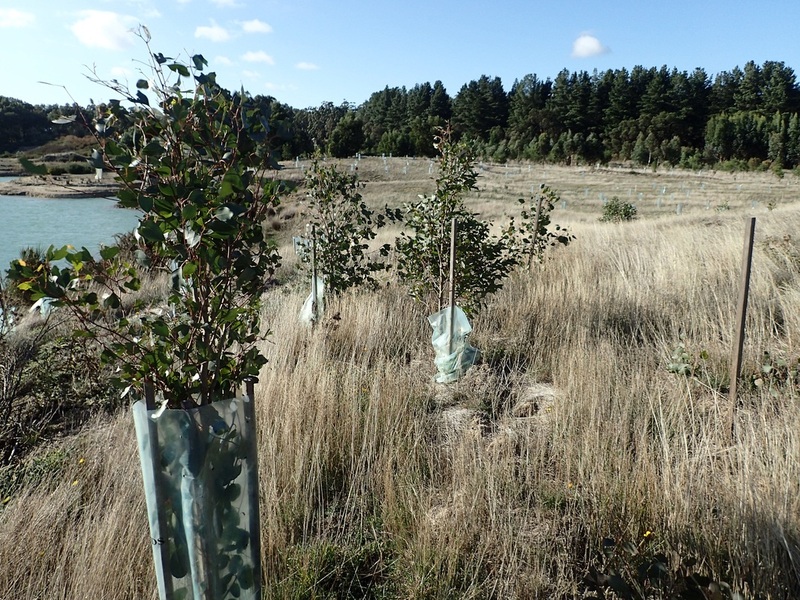 Forestry area: blue gums (globulus and saligna) still doing well. 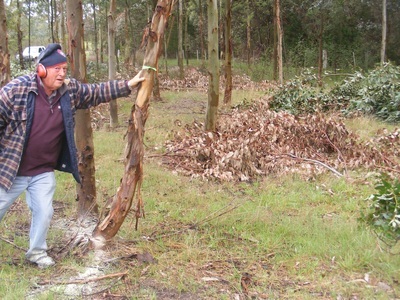 All sugar gums knocked off by frost. 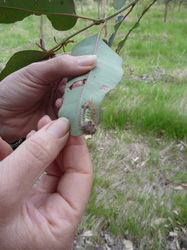 Saw tooth caterpillar skeletising eucs, but not completely. 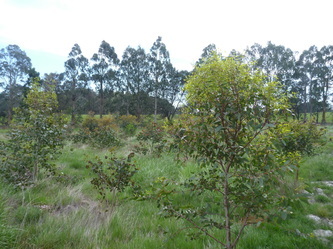 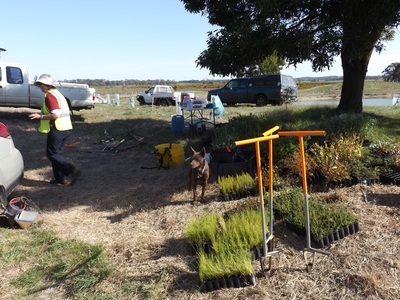 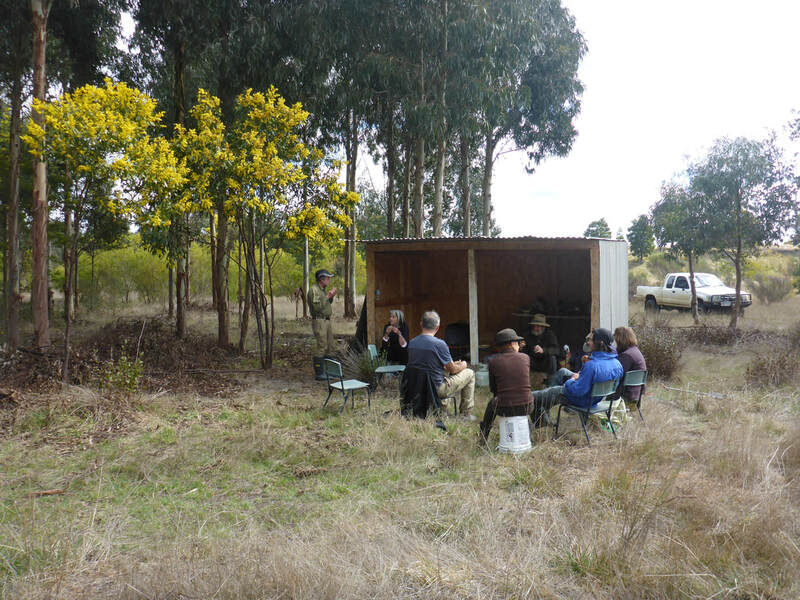 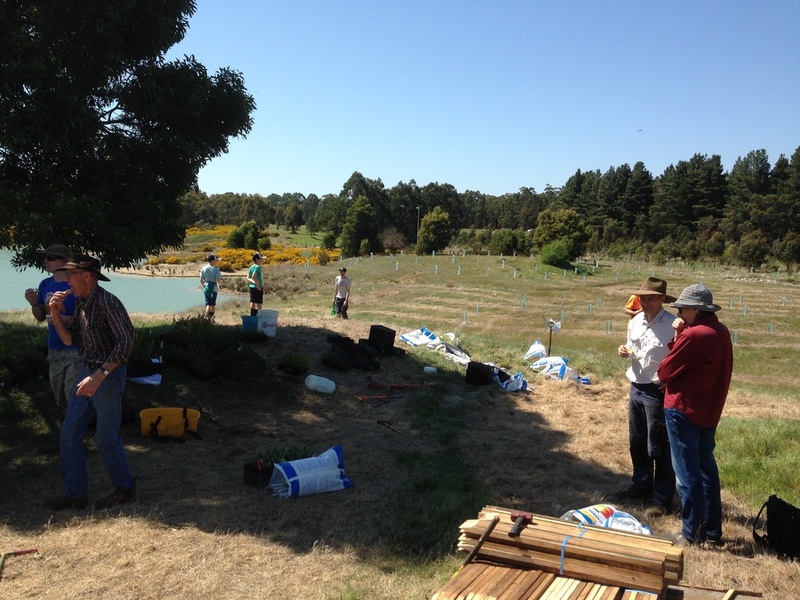 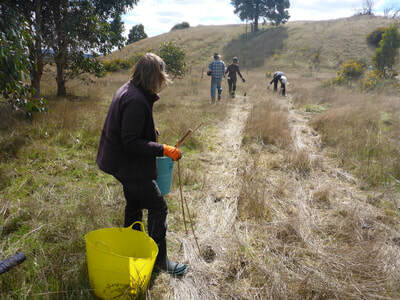 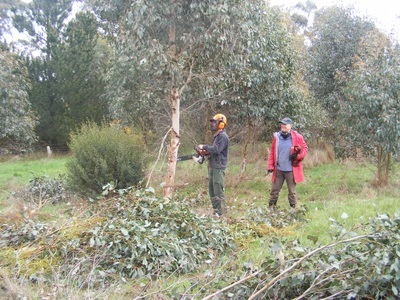 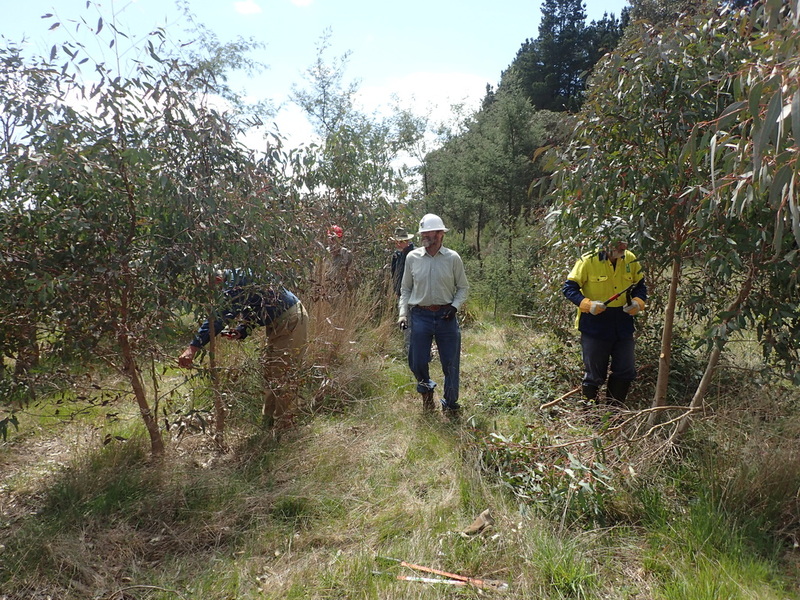 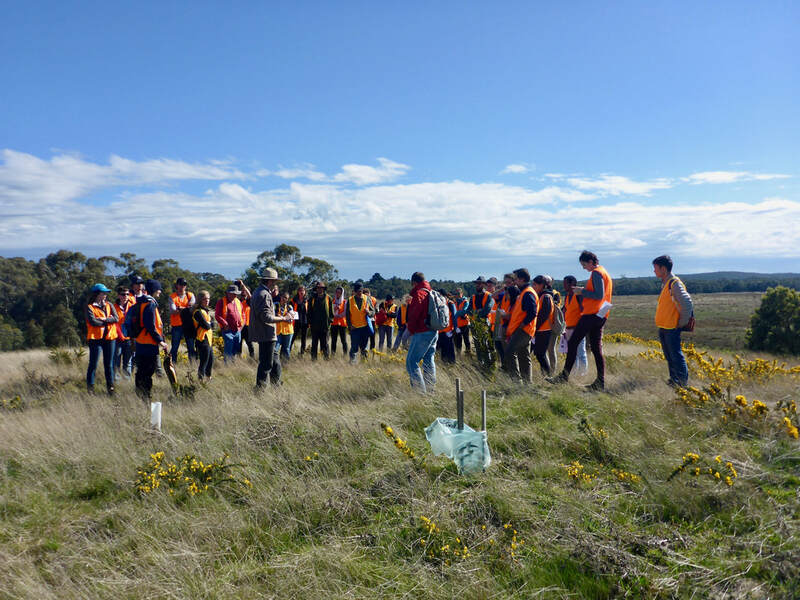 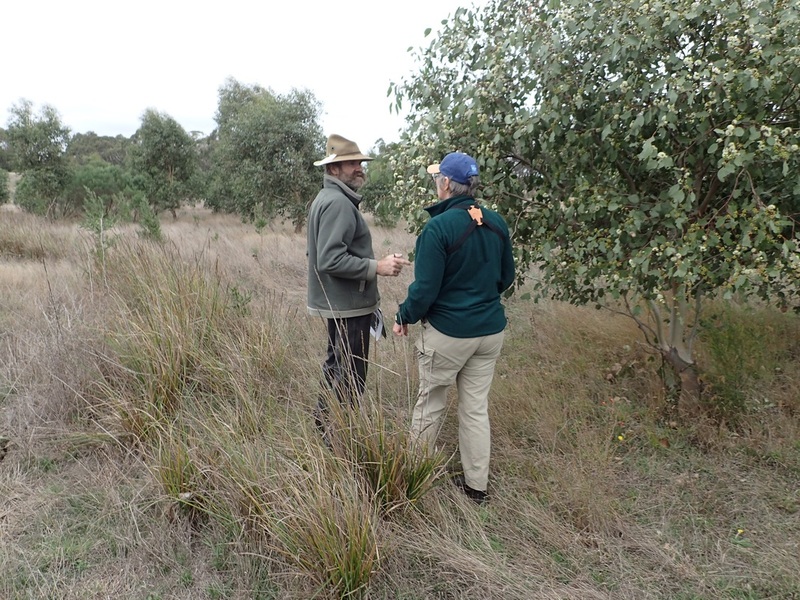 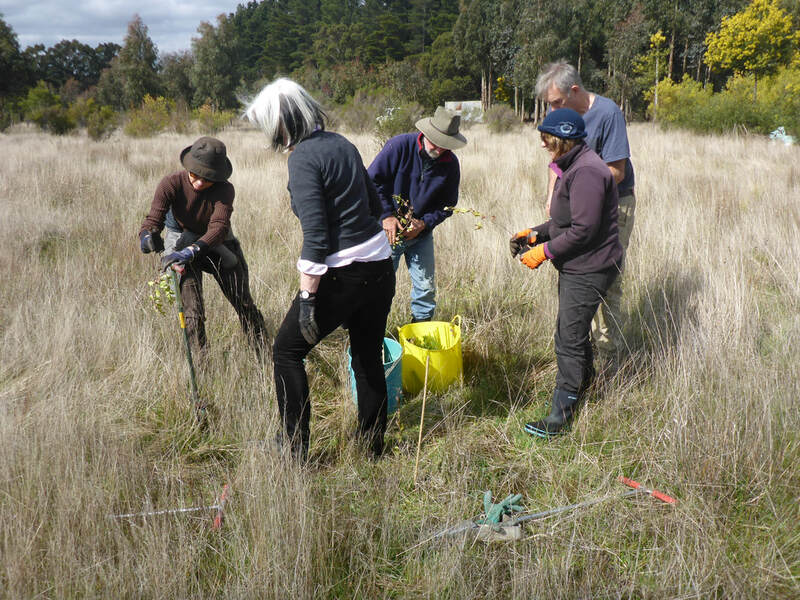 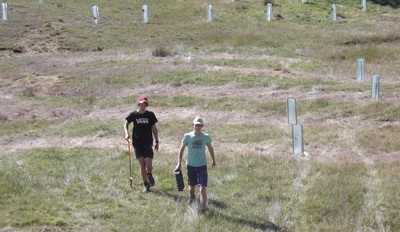 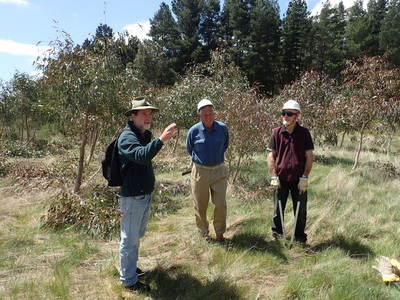 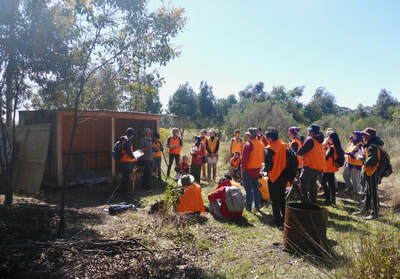 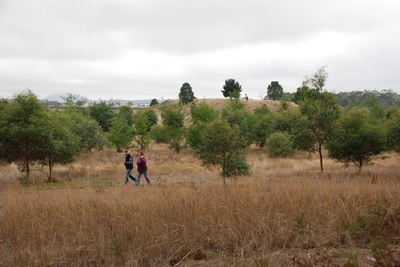 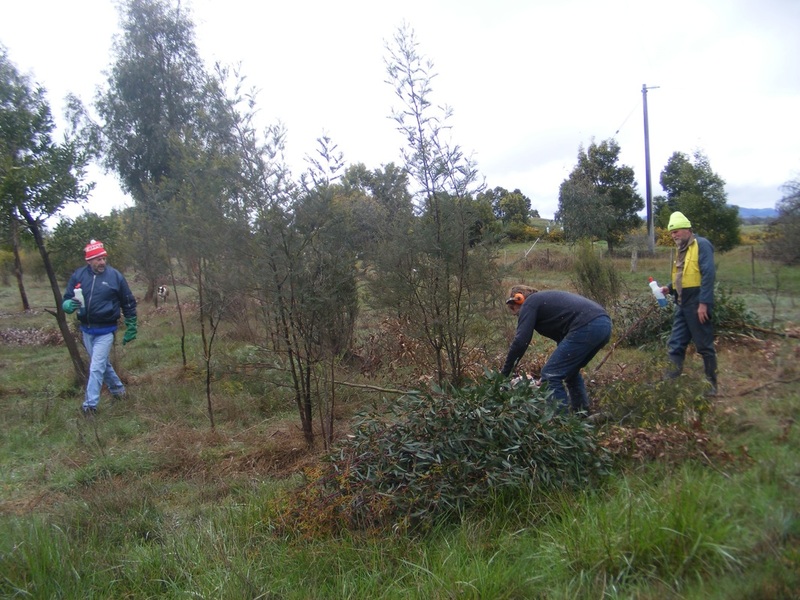 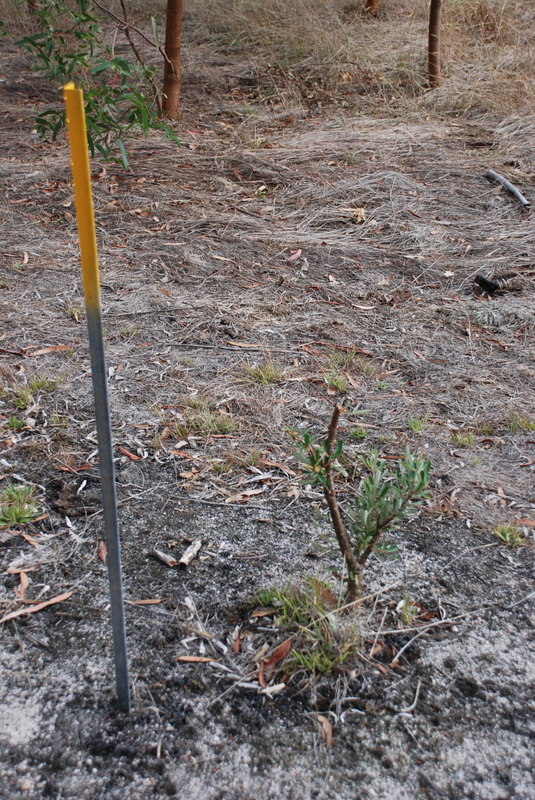 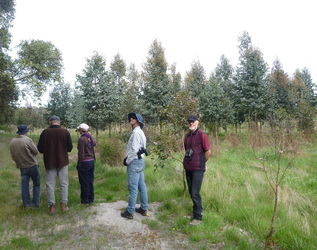 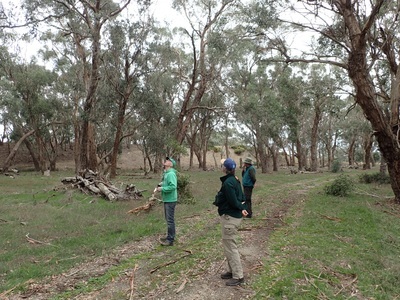 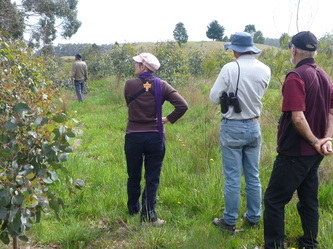 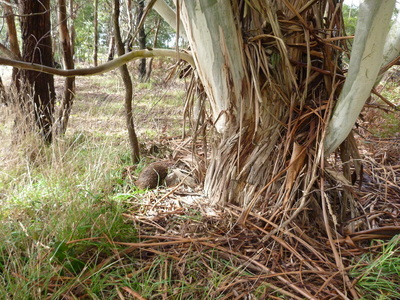 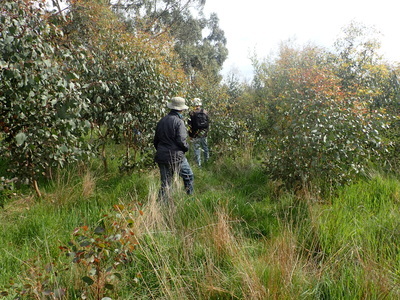 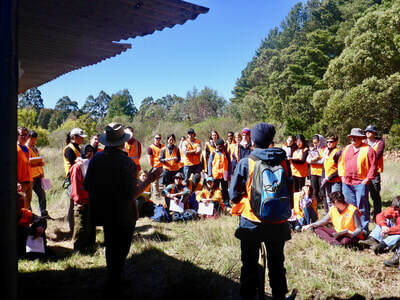 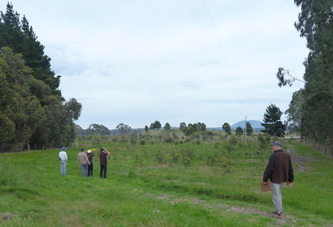 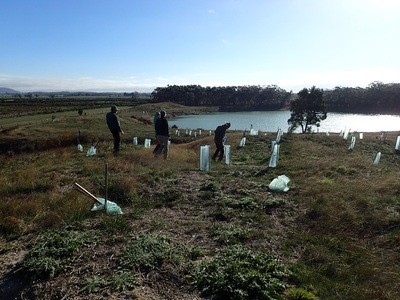 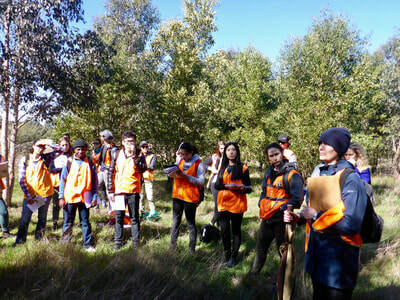 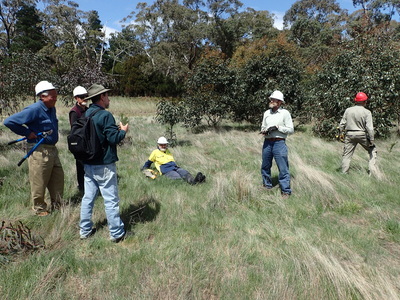 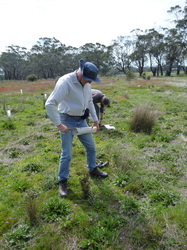 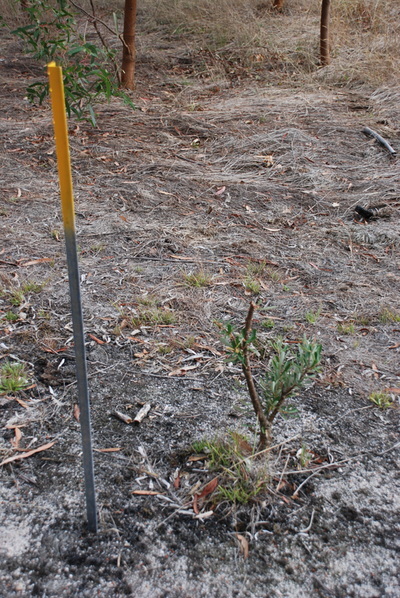 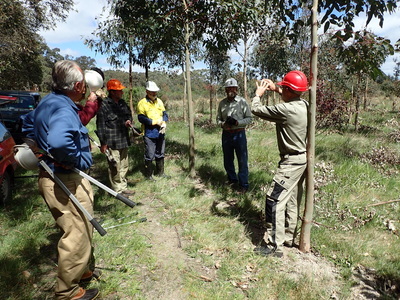 Volunteer manna gum in foreground (left). 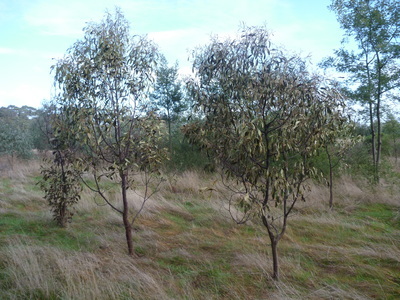 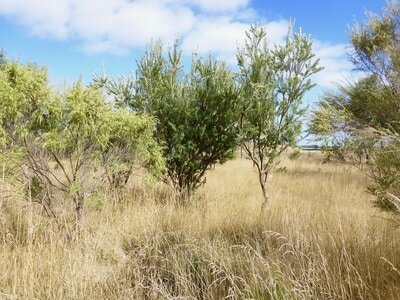 Swamp gum and acacia paradoxa. Panoramic view of ImLal South from hill. 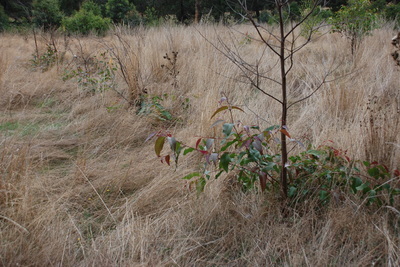 Direct seeding swamped by weeds, but starting to come through in patches. Large dam between ImLal South and north site. 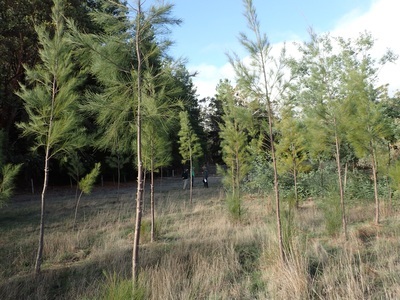 Some of the redwoods hang in there at ImLal North. But ImLal North as a whole is largely bereft of reveg and what is left is being hammered by roos. 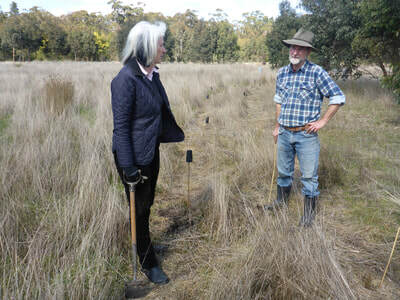 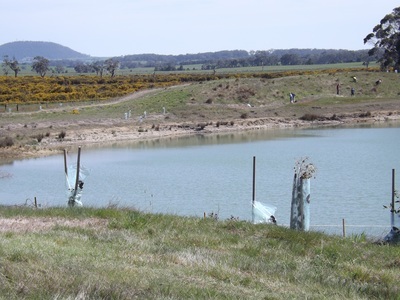 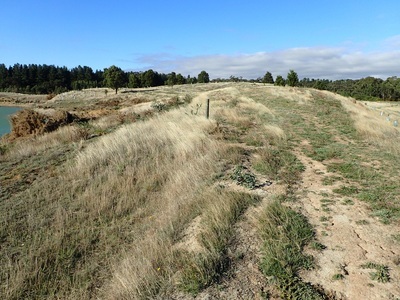 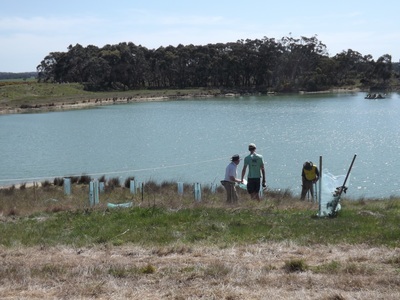 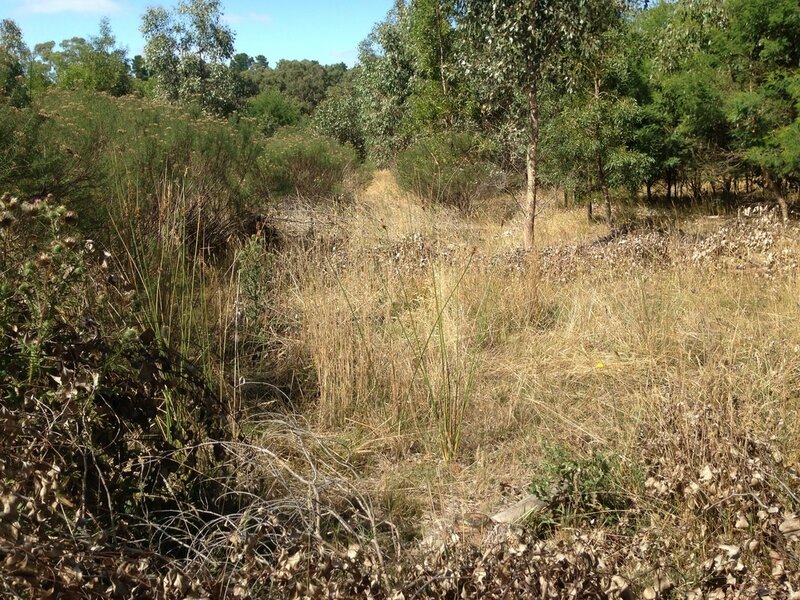 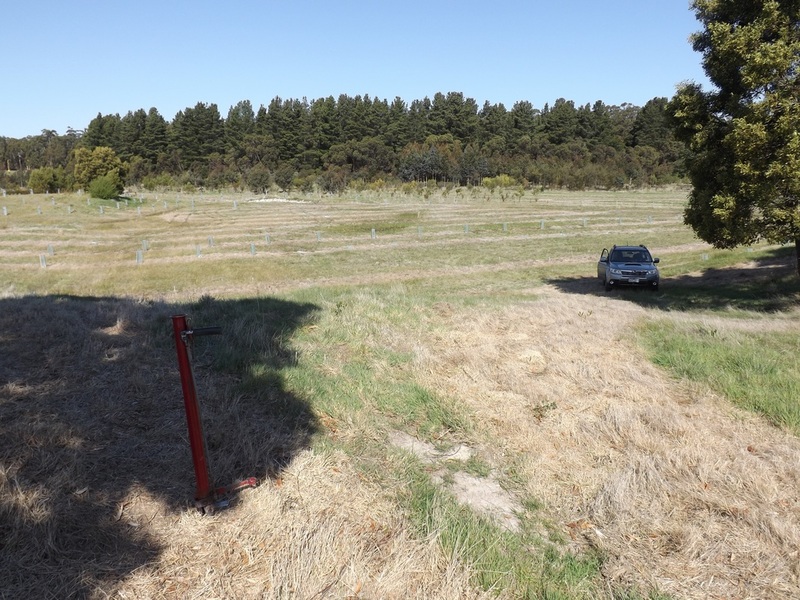 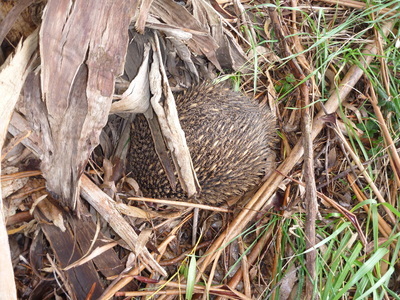 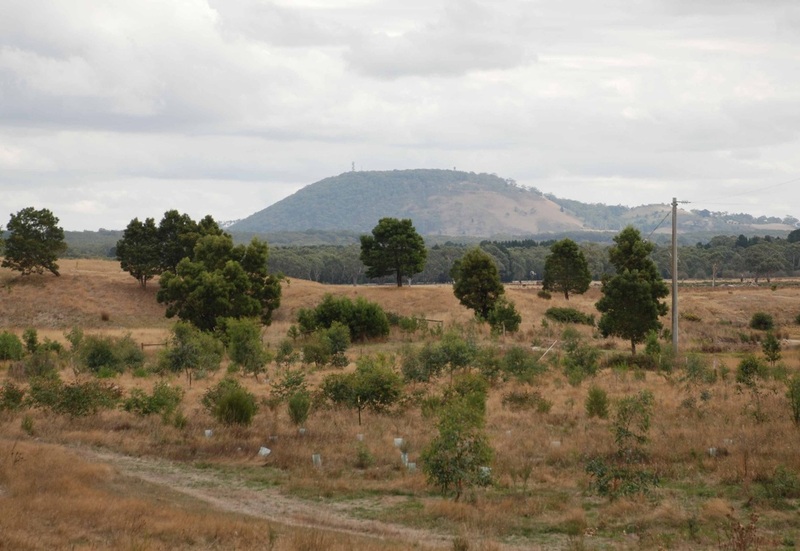 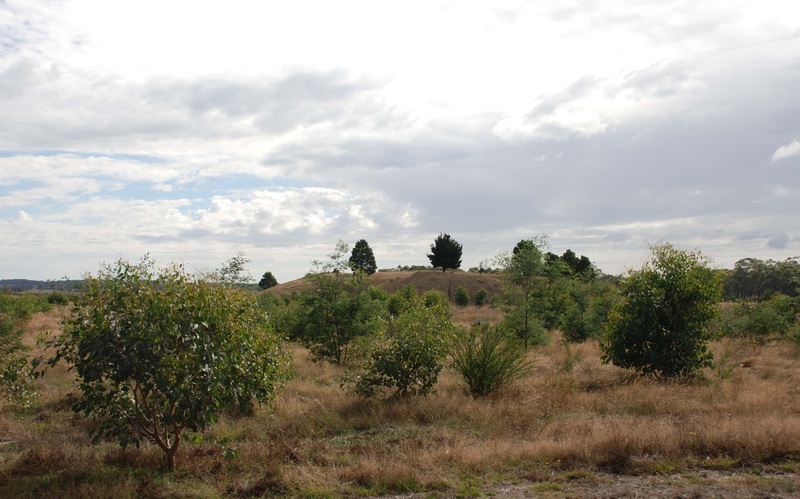 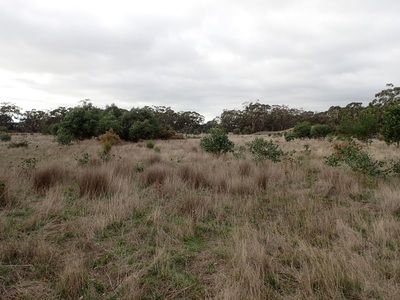 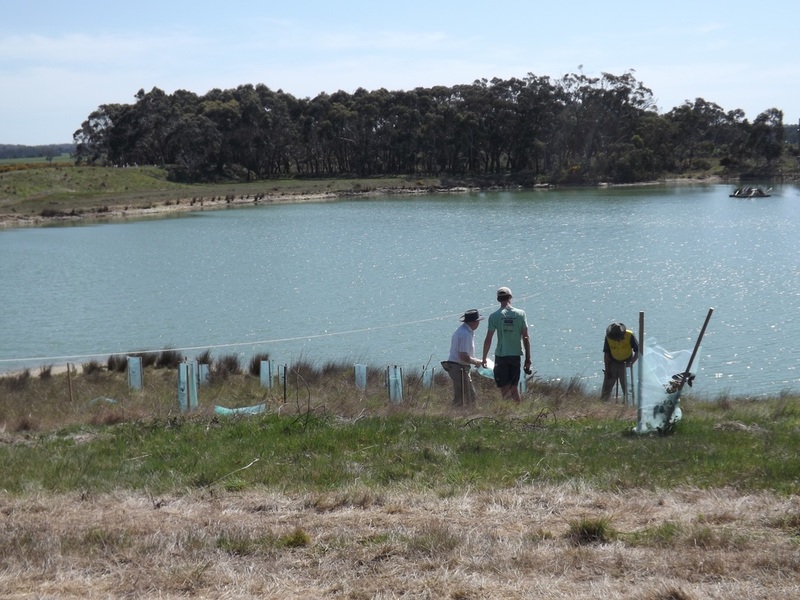 Site has been planted twice – looks like it's just too swampy. 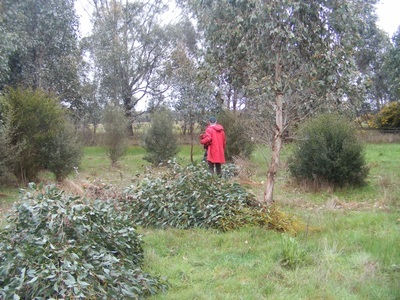 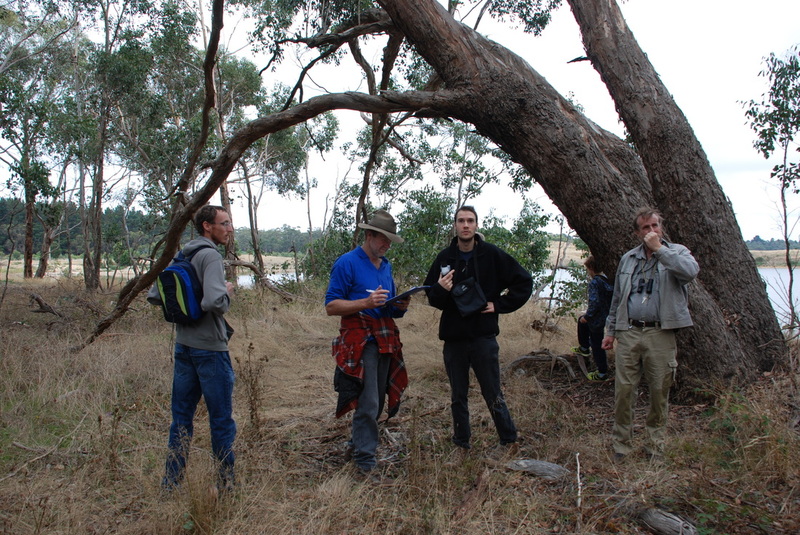 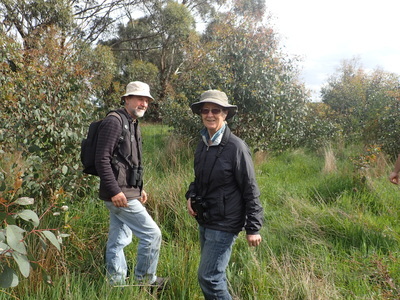 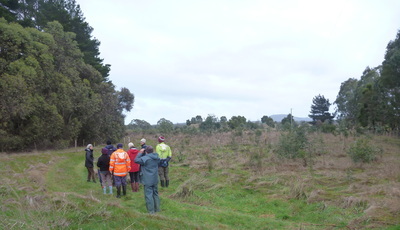 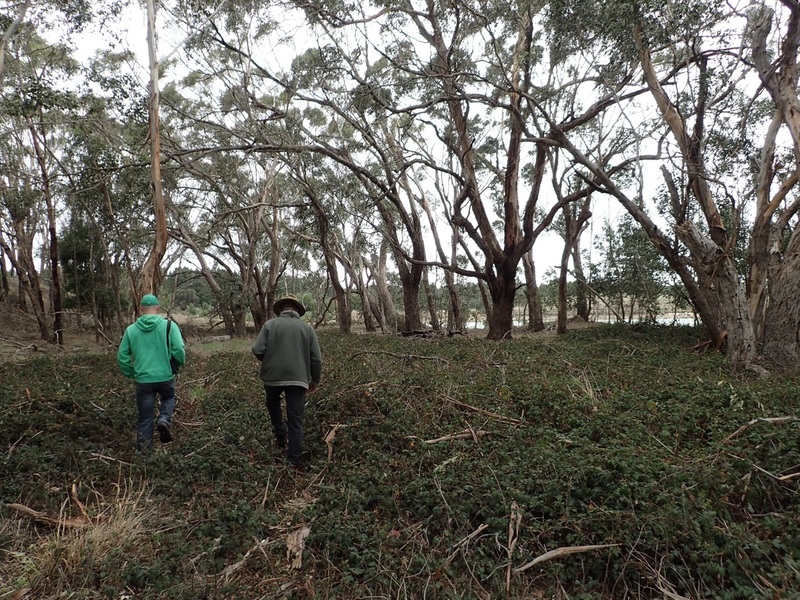 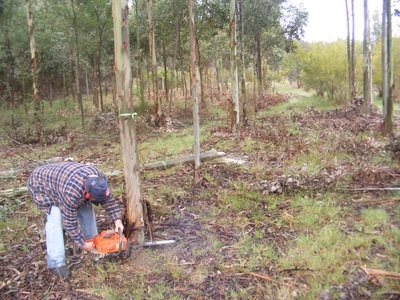 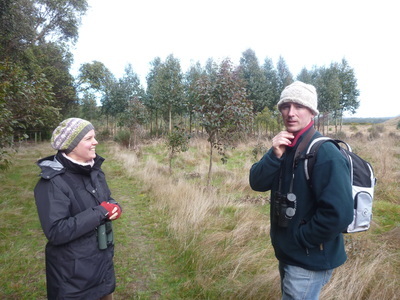 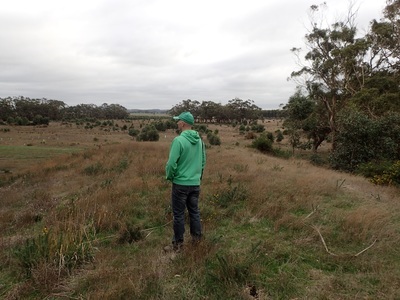 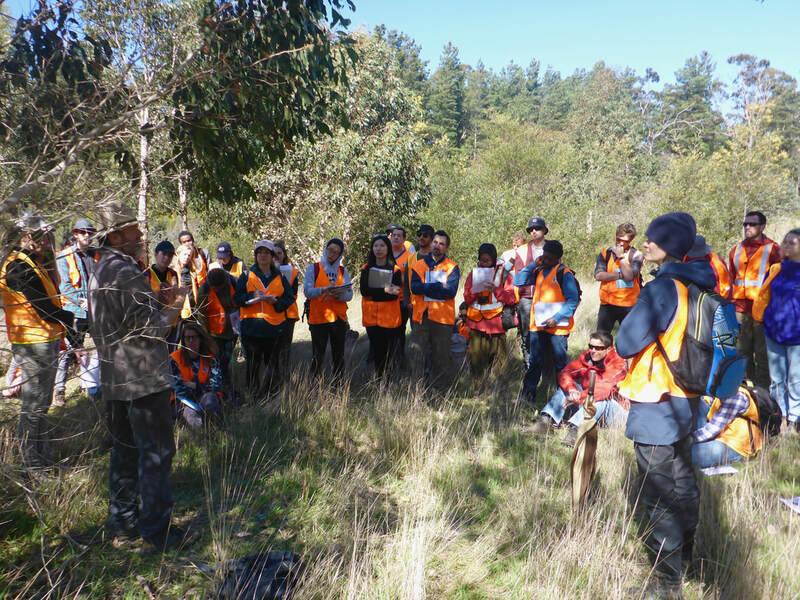 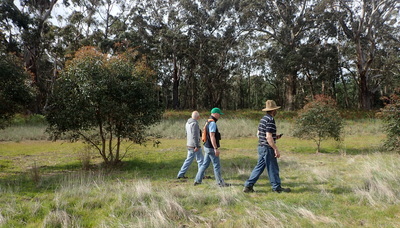 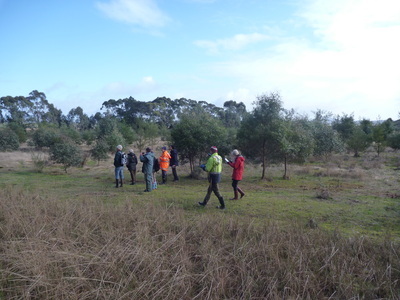 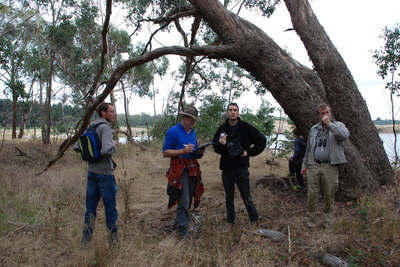 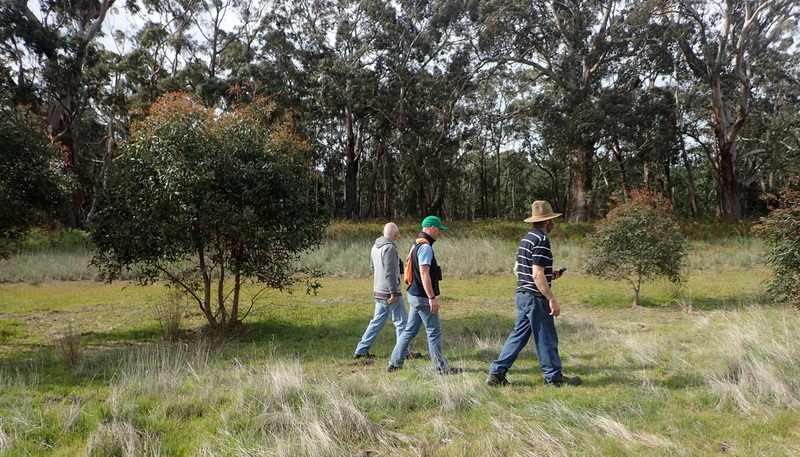 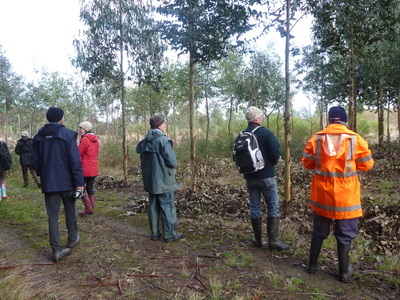 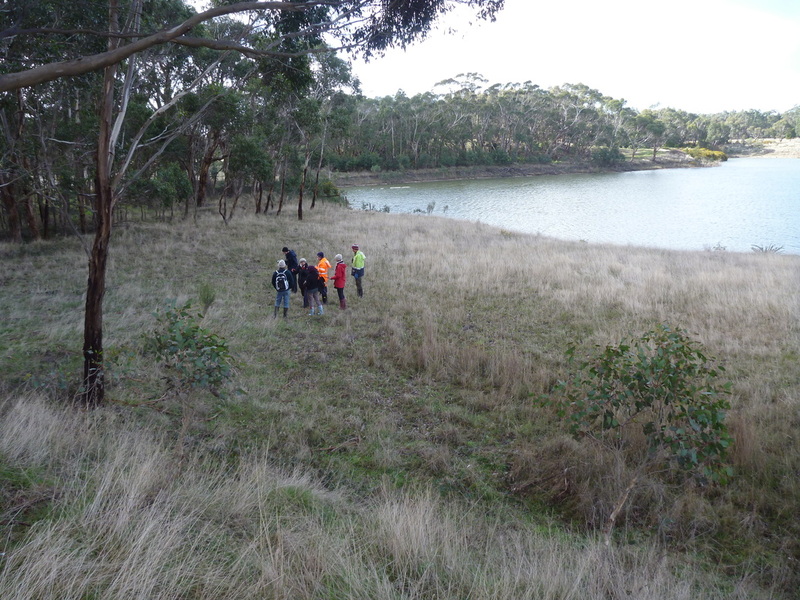 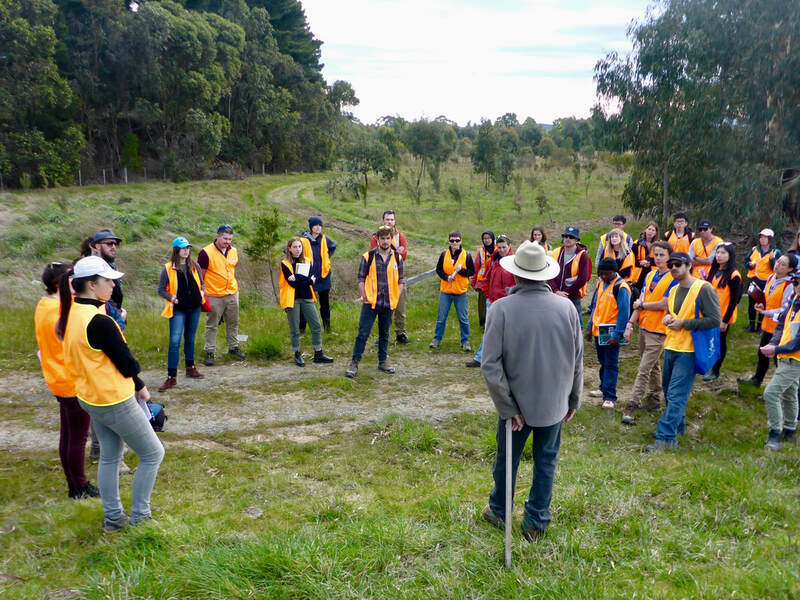 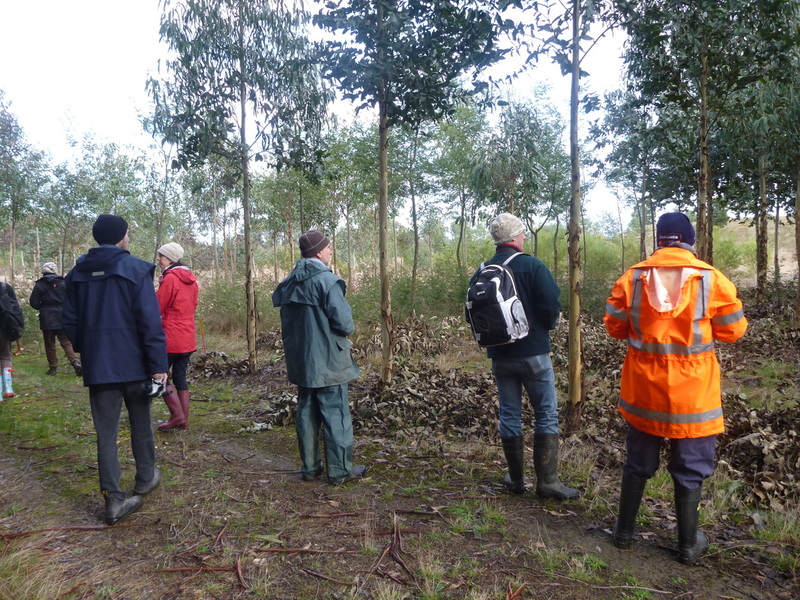 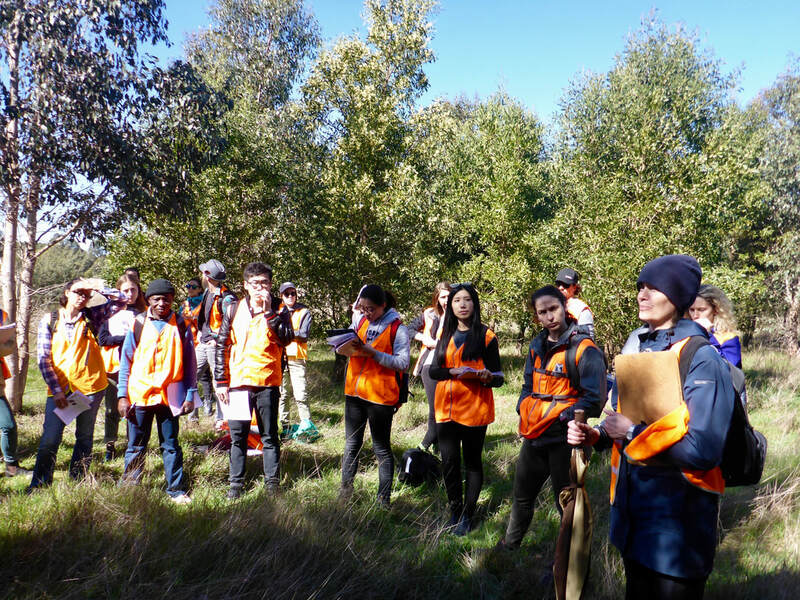 Among the remnant swamp gum between the two biorich sites. 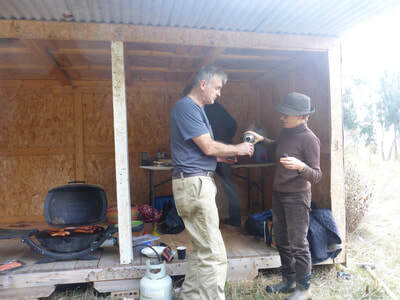 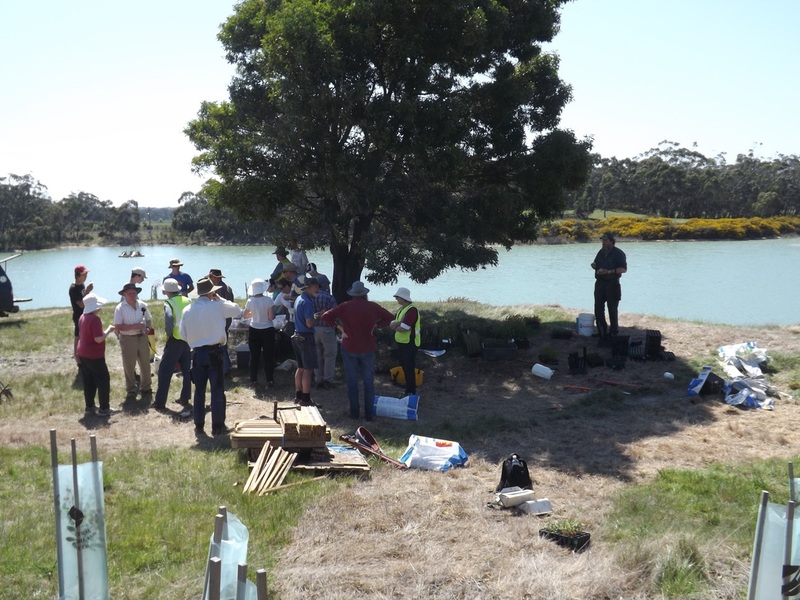 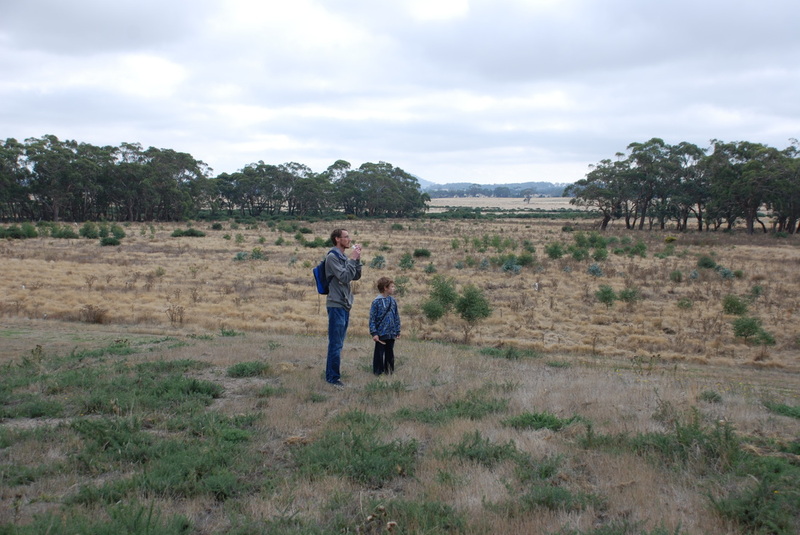 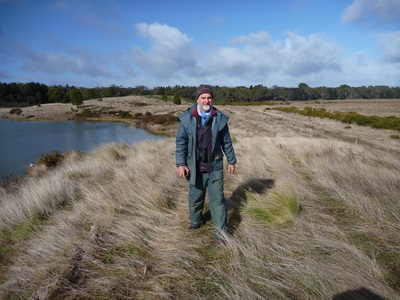 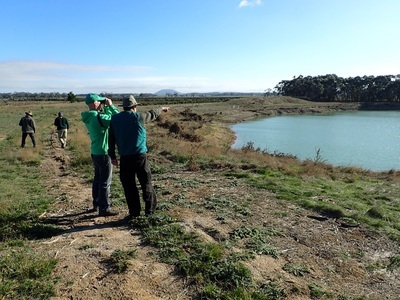 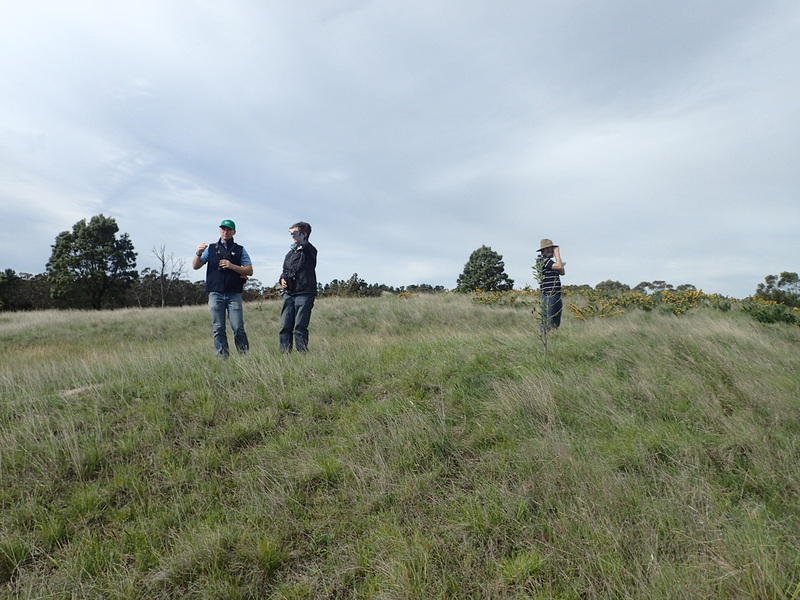 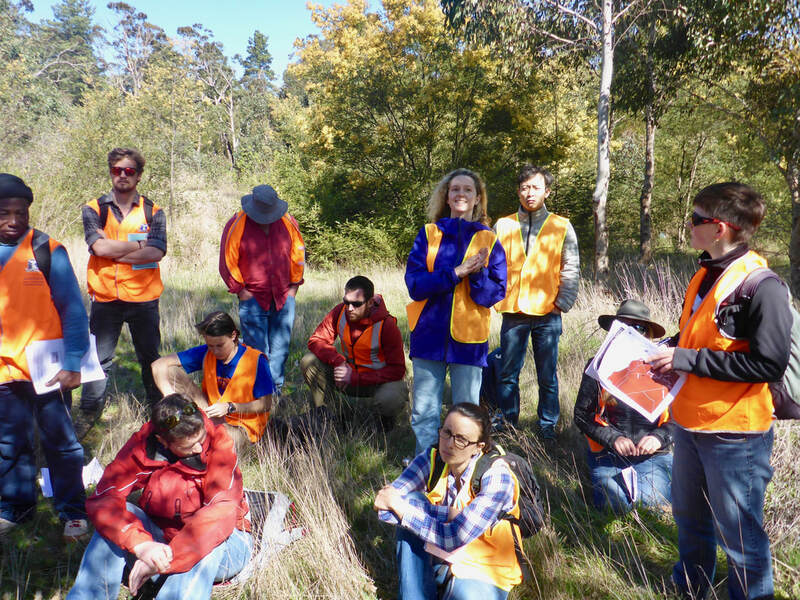 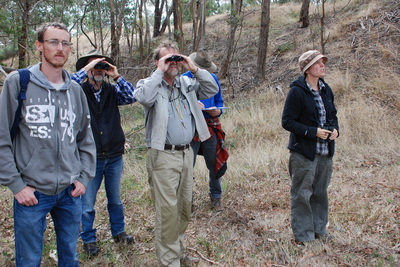 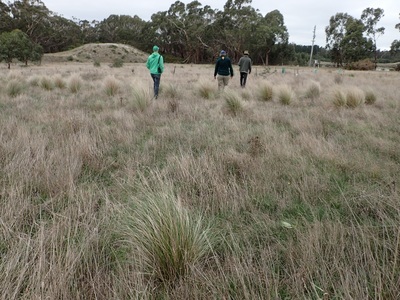 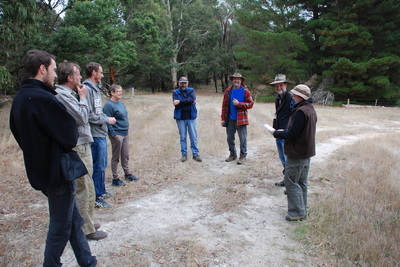 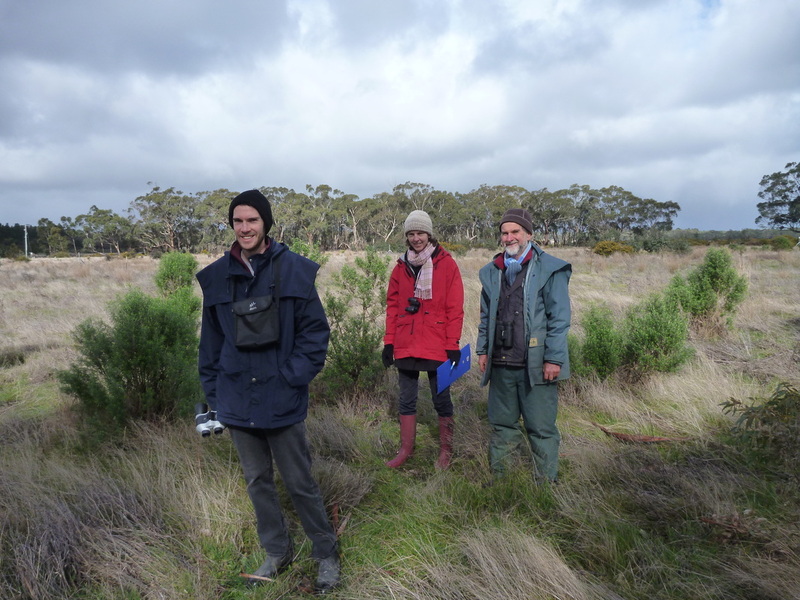 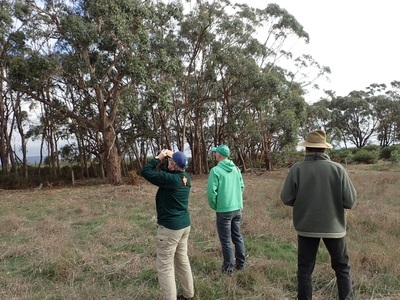 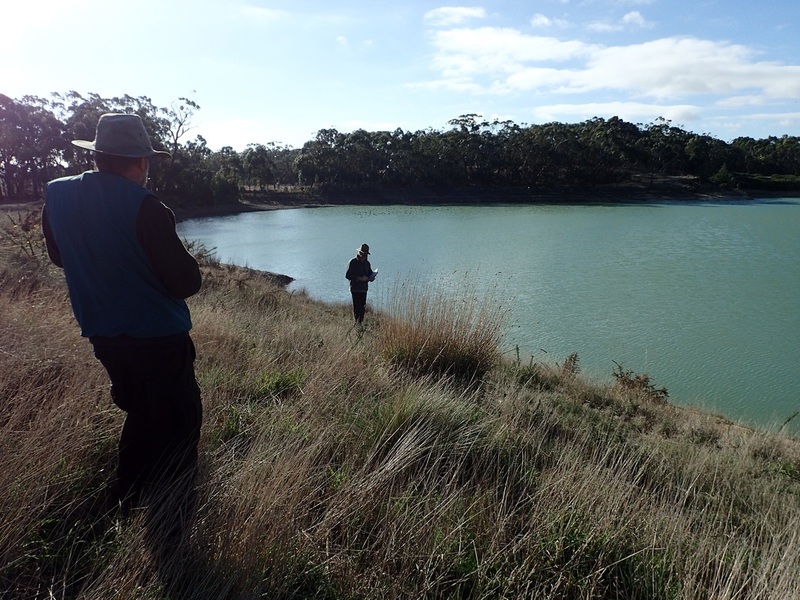 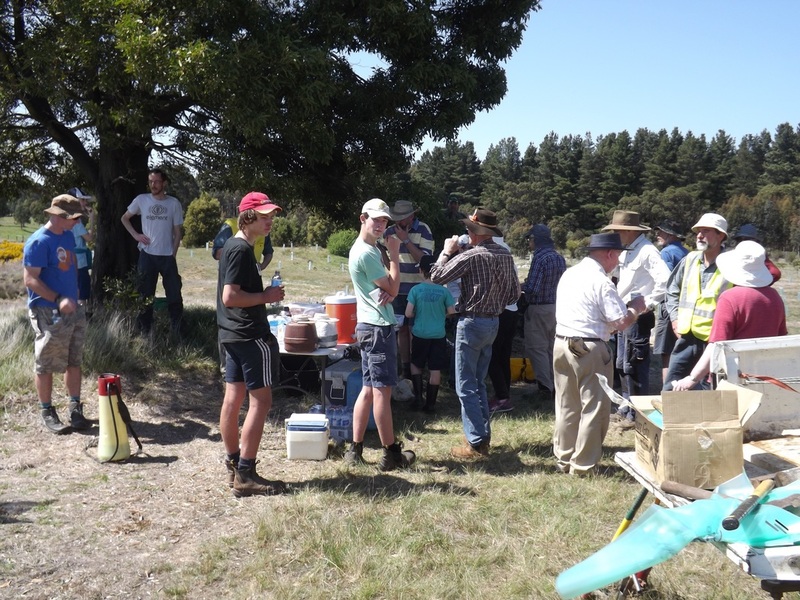 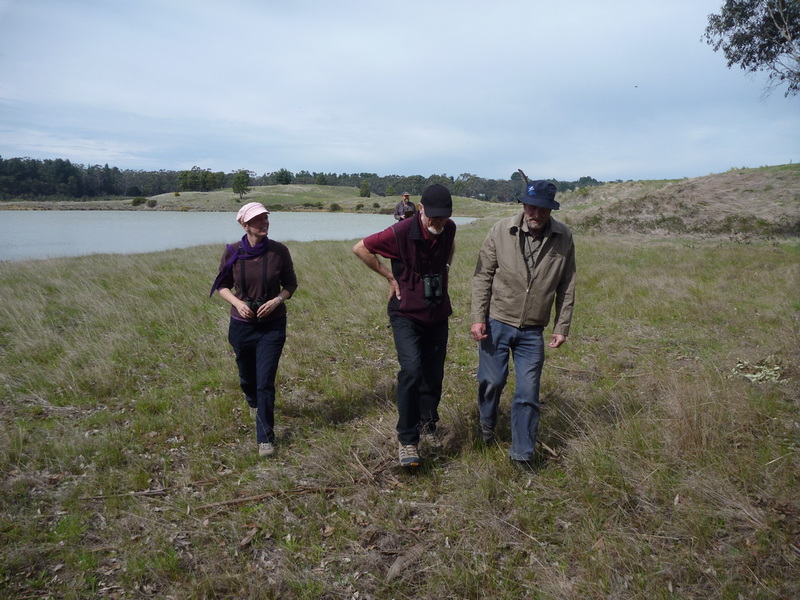 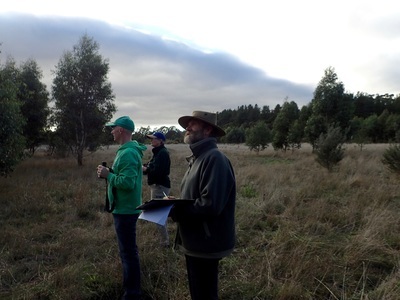 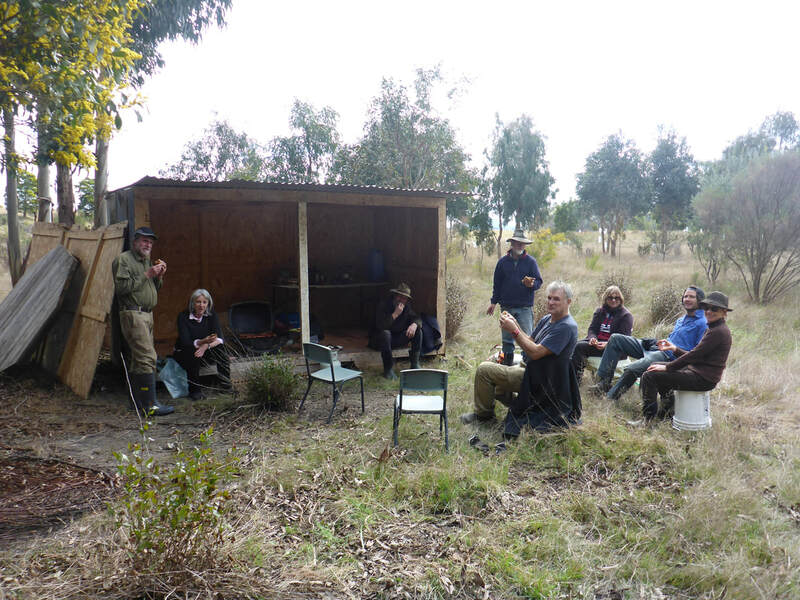 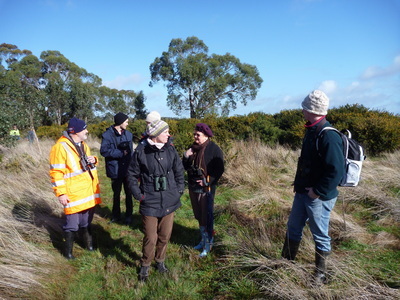 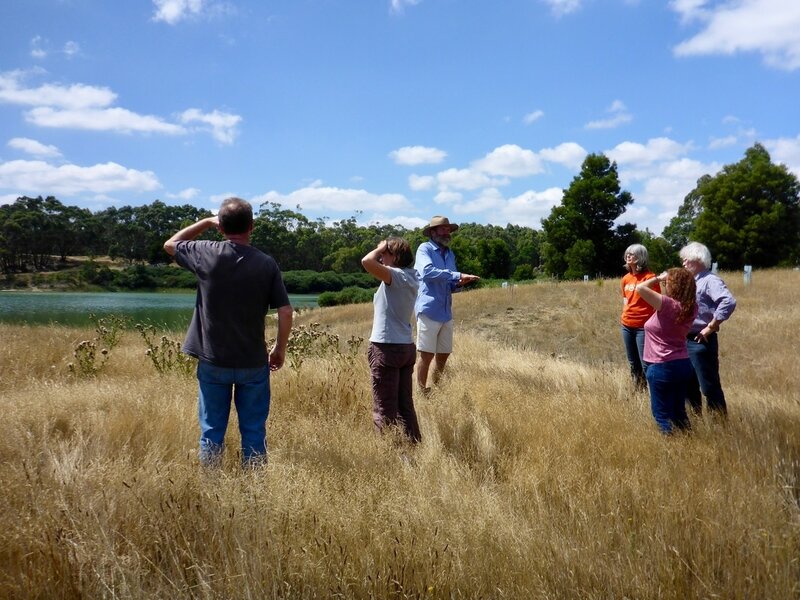 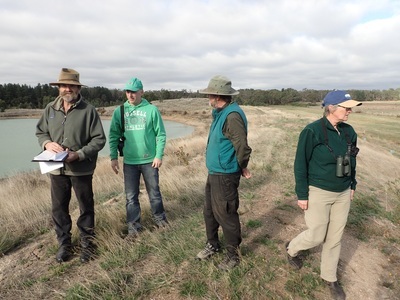 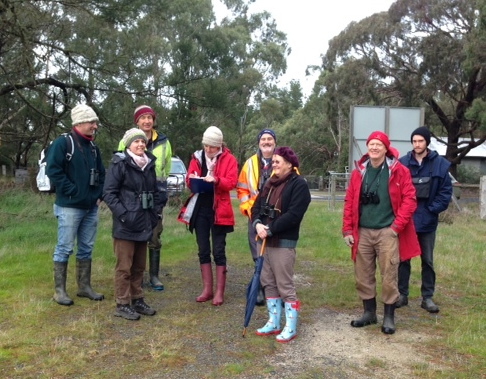 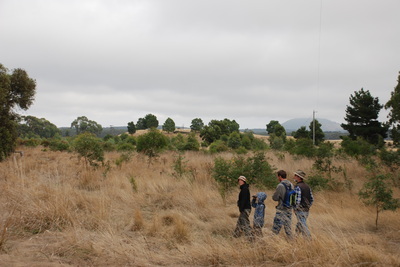 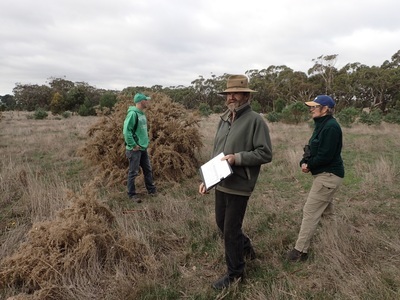 End of the two hour bird survey: one new species – nankeen kestrel. ImLal Sth growing well after two years since first planted. 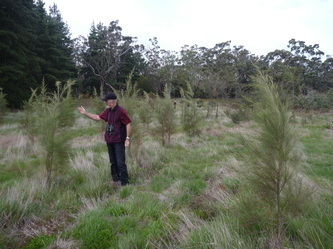 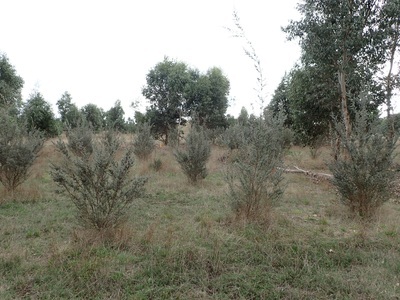 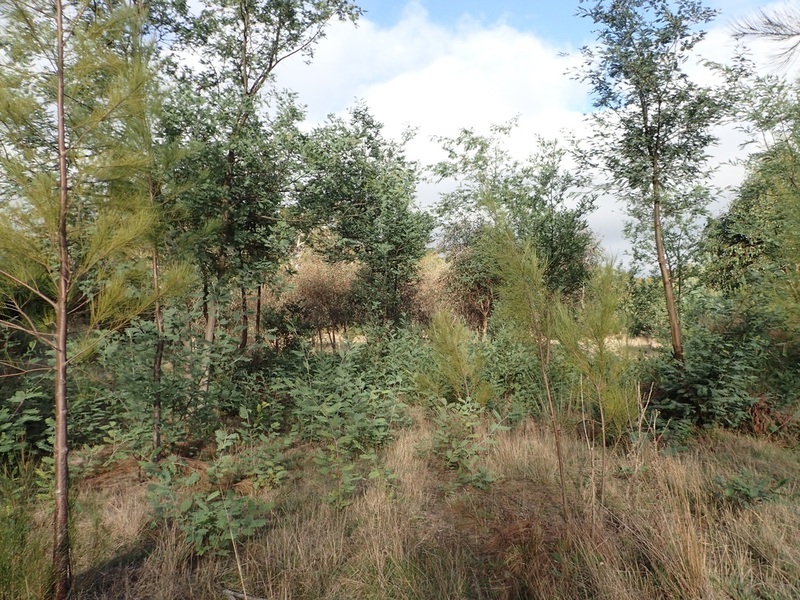 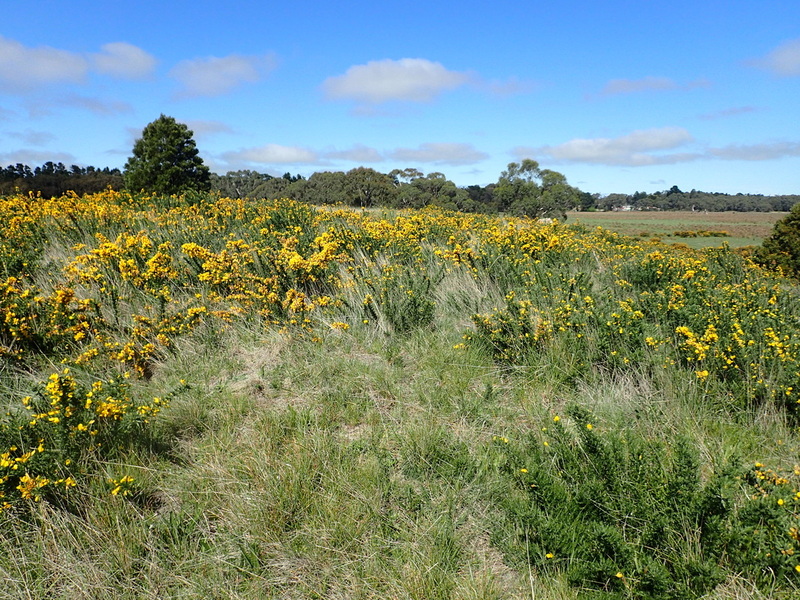 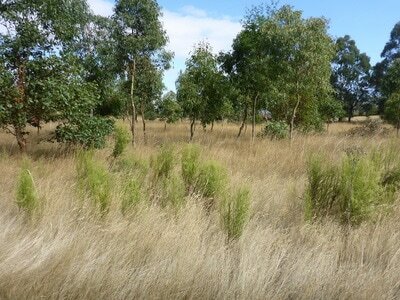 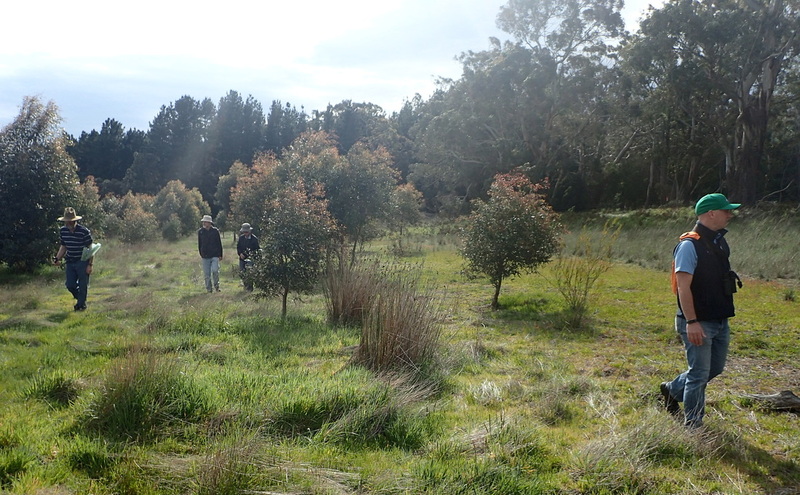 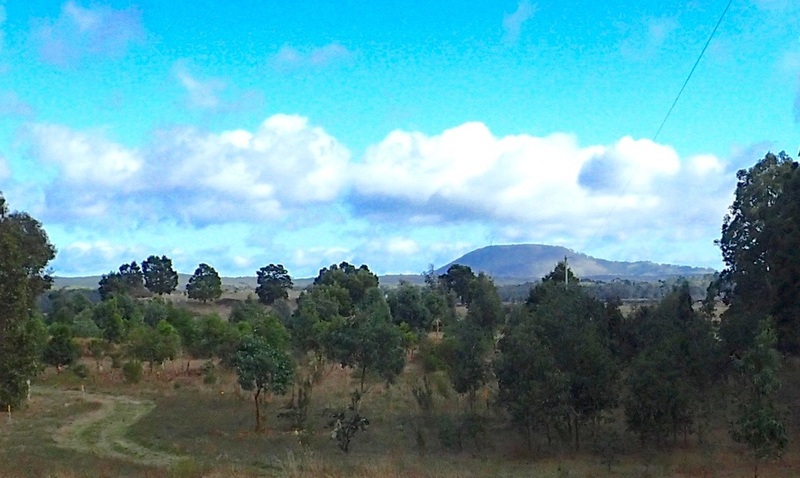 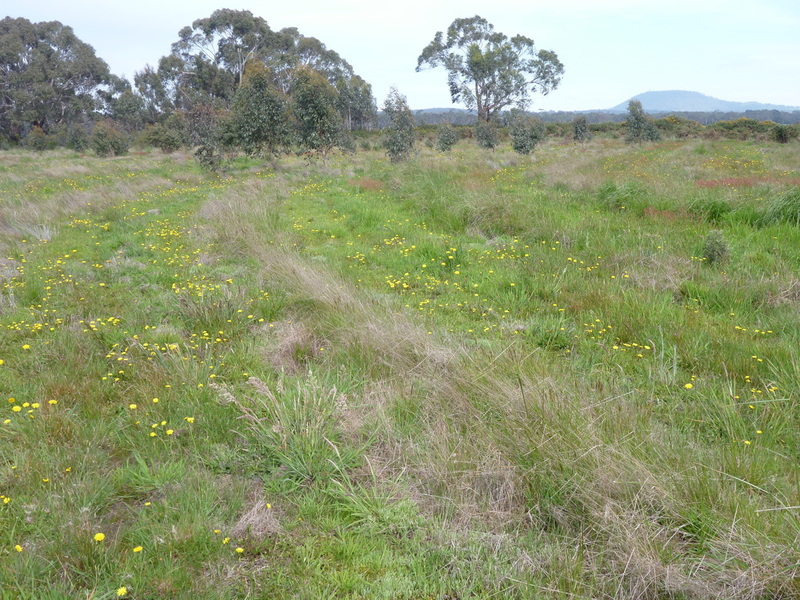 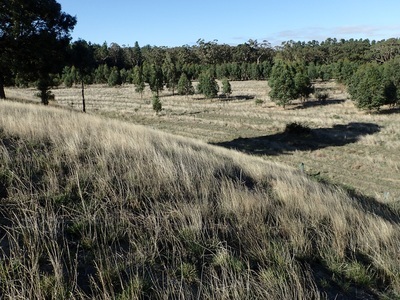 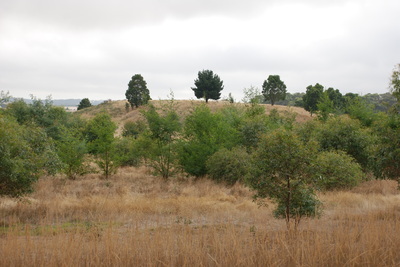 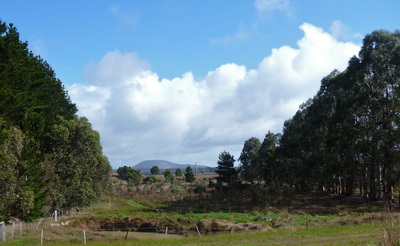 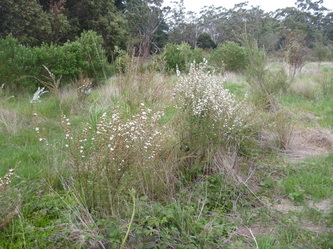 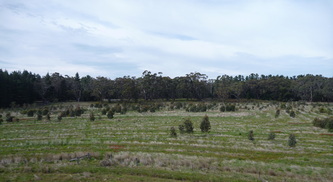 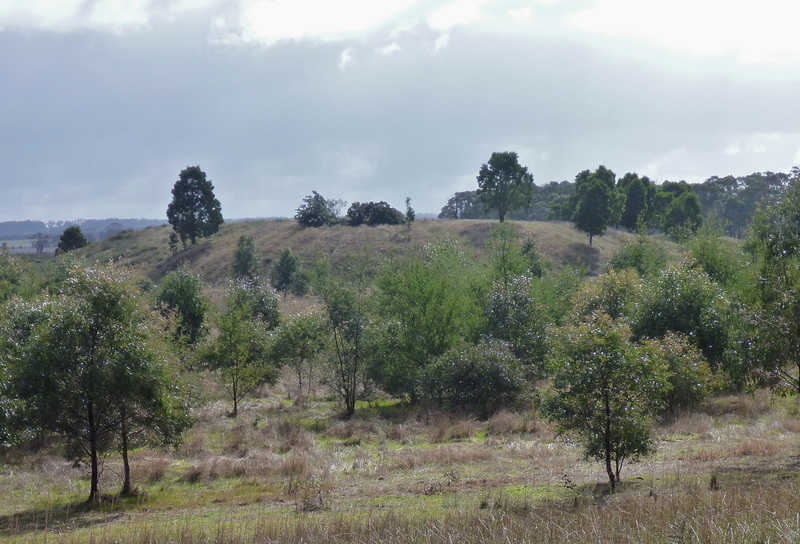 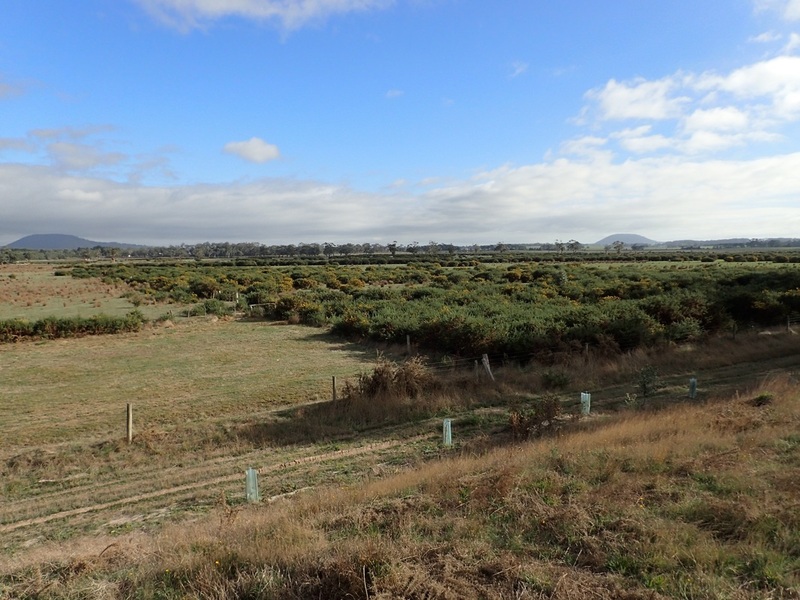 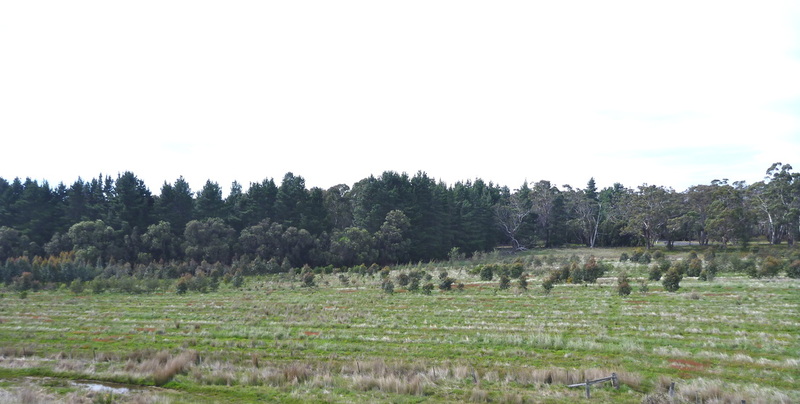 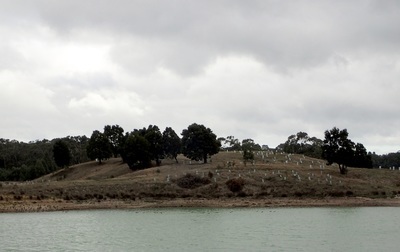 Cassinia and wattles in foreground; eucalypts to the rear.